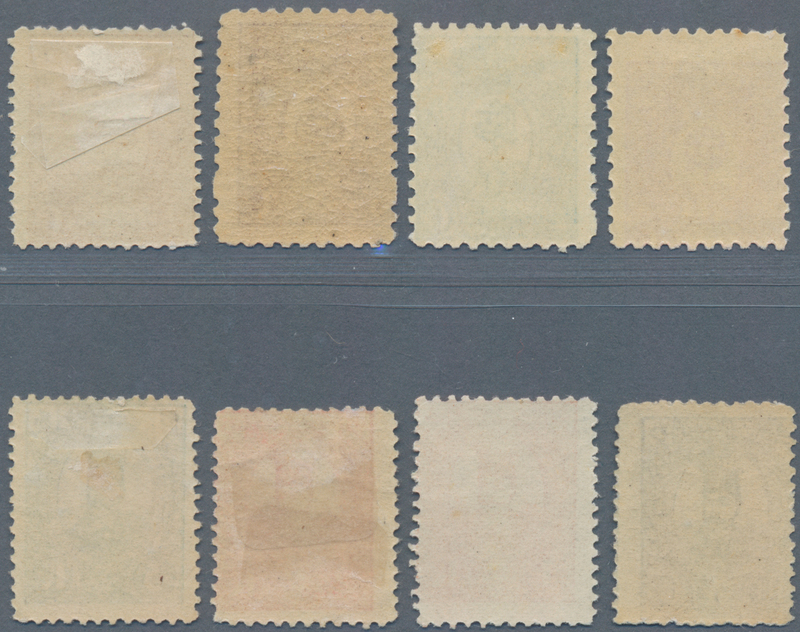 8252 ungebraucht ohne Gummi (unused without gum) (*) ungebraucht (hinged) * Sc. 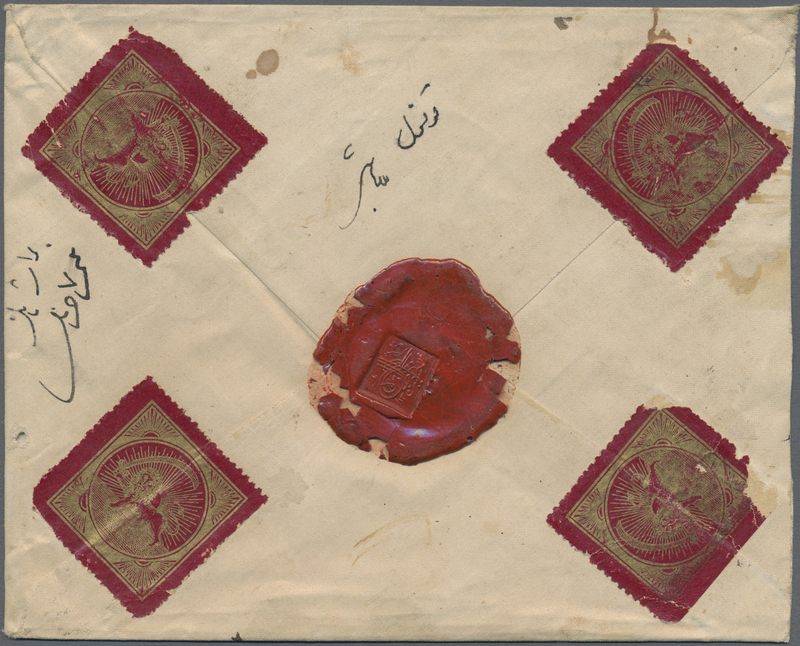 41/46 1879/1880, Nasser-edin Shah, 1ch. 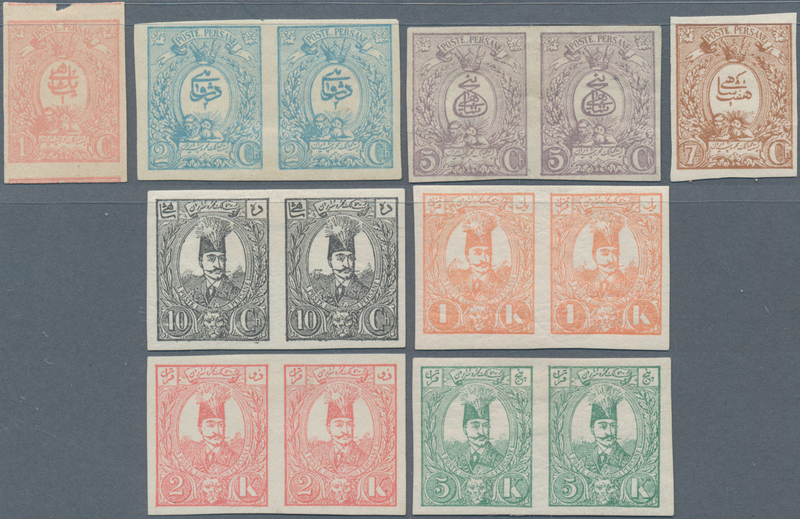 to 5kr., complete set of six values, fresh colours, unused. 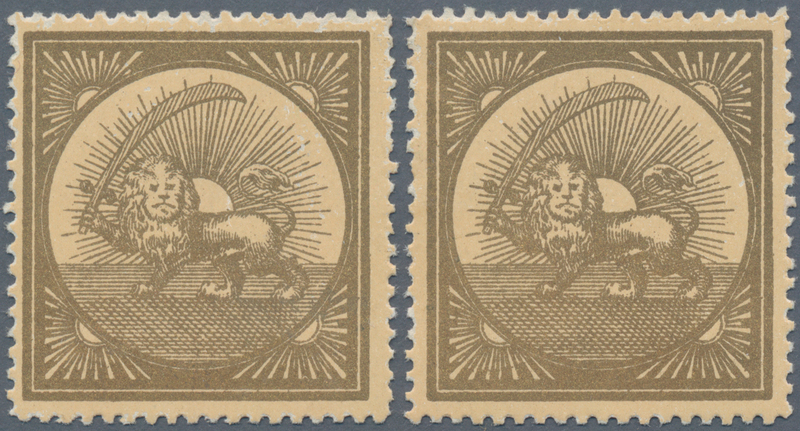 8253 ungebraucht ohne Gummi (unused without gum) (*) Proof Sc. 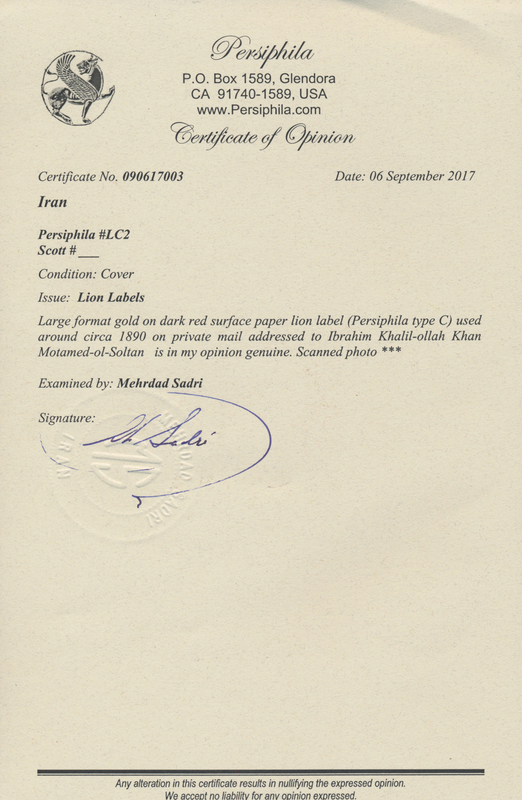 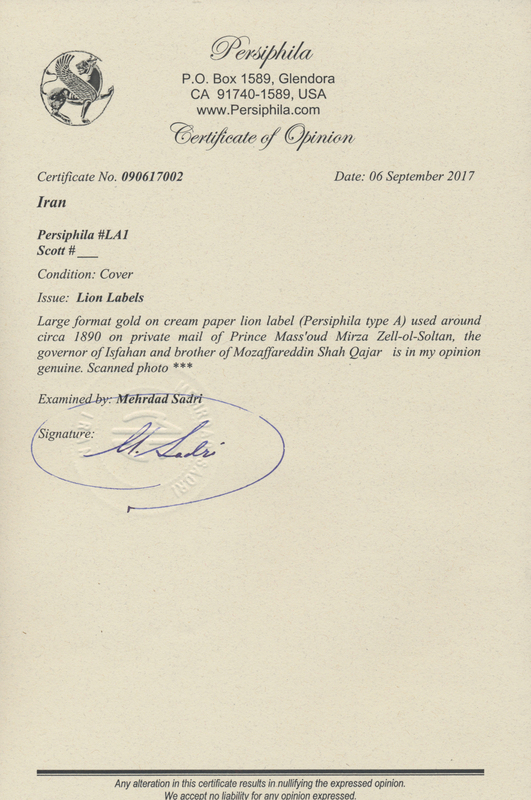 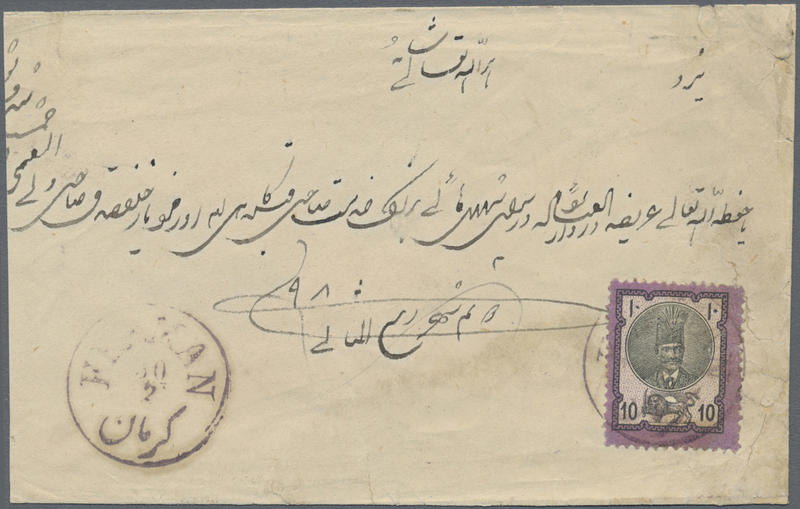 46 1880, Nasser-eddin Shah issue imperf proof on yellow paper of 10 Sh. 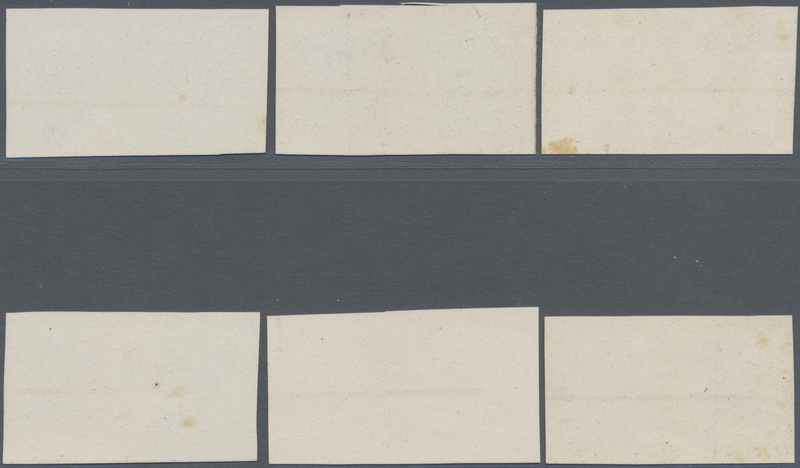 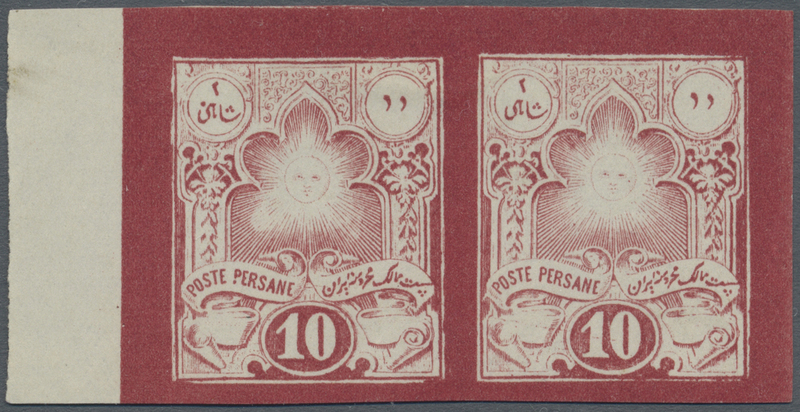 violet black in original colors in a corner margin block of four with full margins, very fresh, fine and scarce. 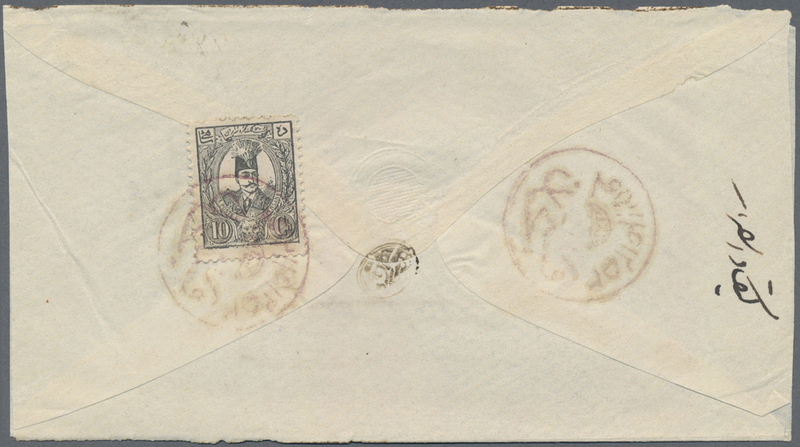 8255 Brief (cover) 33 (2) TEHERAN - RARE REGISTERED UPRATED 5ch POSTAL STATIONERY ENVELOPE TO OVERSEAS: Attractive 29 Sept. 1880 usage of the 5ch postal stationery envelope (minor wear inc. small corner fault at lower right) registered to Berlin uprated with 2nd Portrait 5ch black & green vertical pair tied and cancelled by mainly very fine “TEHERAN” cds’s with a faint bilingual Teheran boxed “RECOM” mark on the front, having overlapped “TABRIZ” (4 Oct. ) and Berlin (21 Oct. ) backstamps. 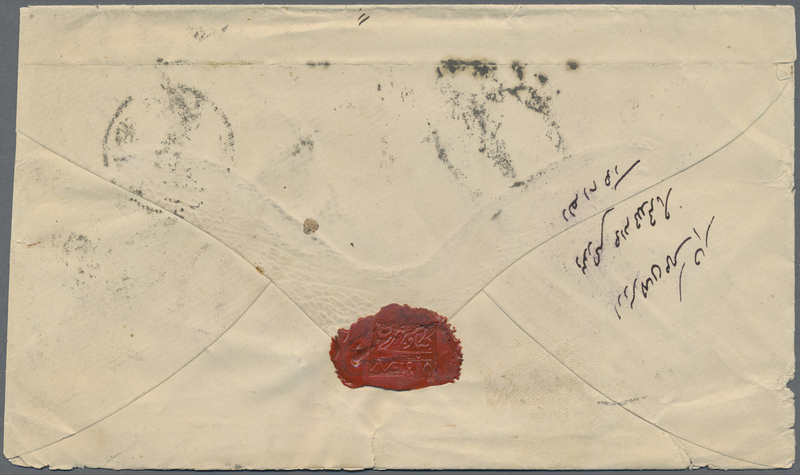 Overseas Registered mail at this early date is rare. 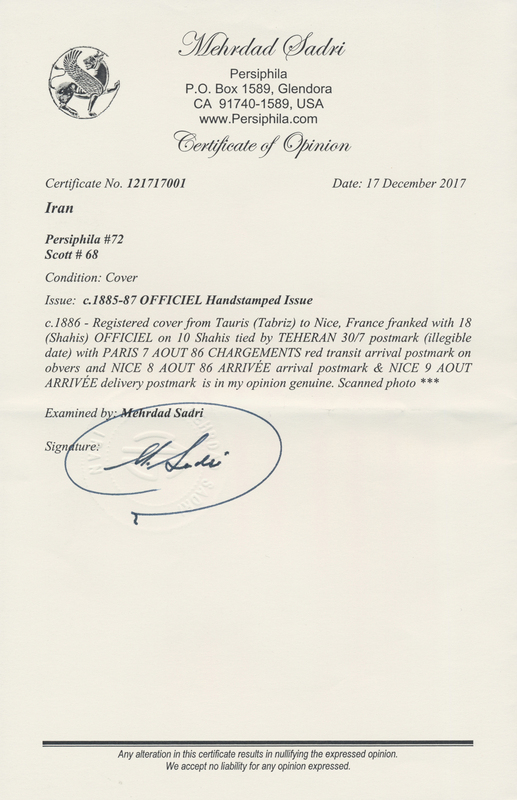 Exhibition Quality. 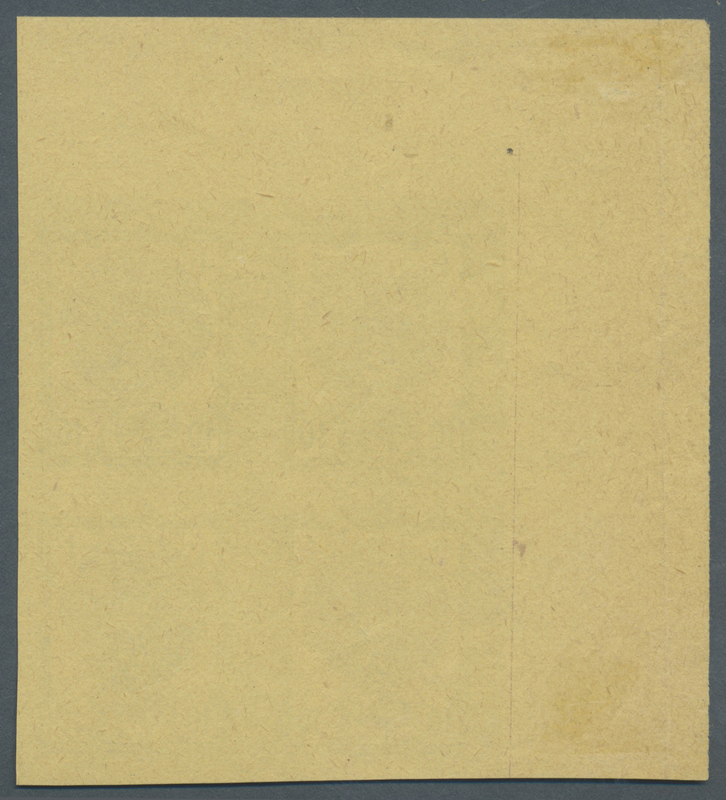 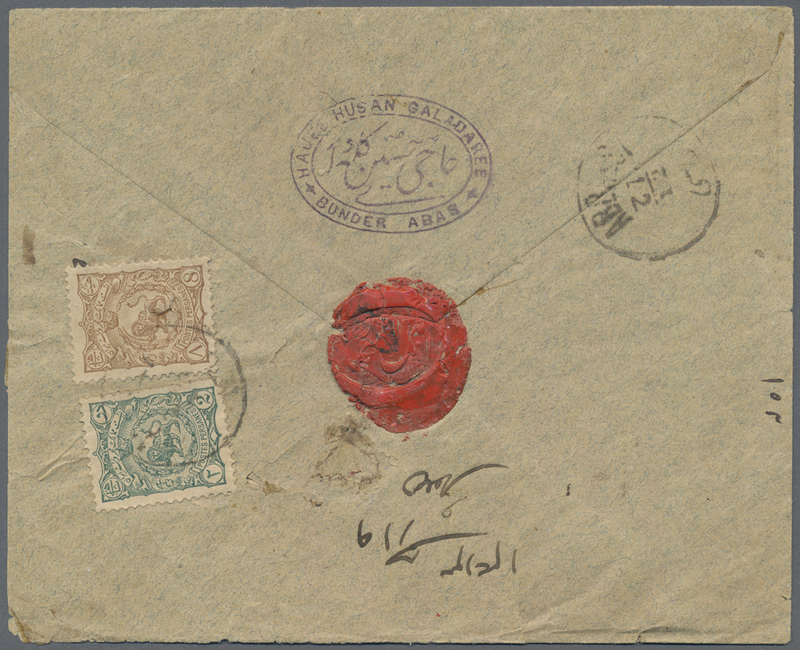 8263 Brief (cover) Sc. 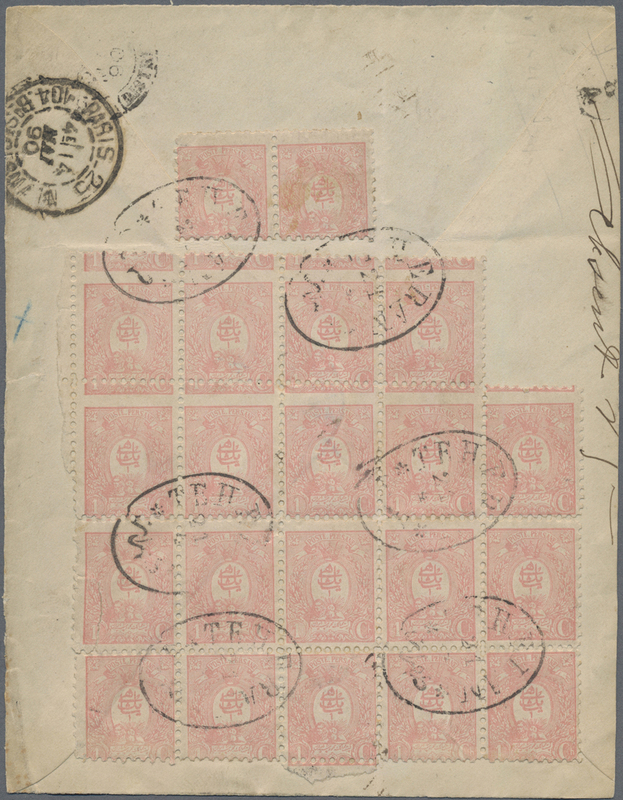 62 (5) 1885, 5ch. 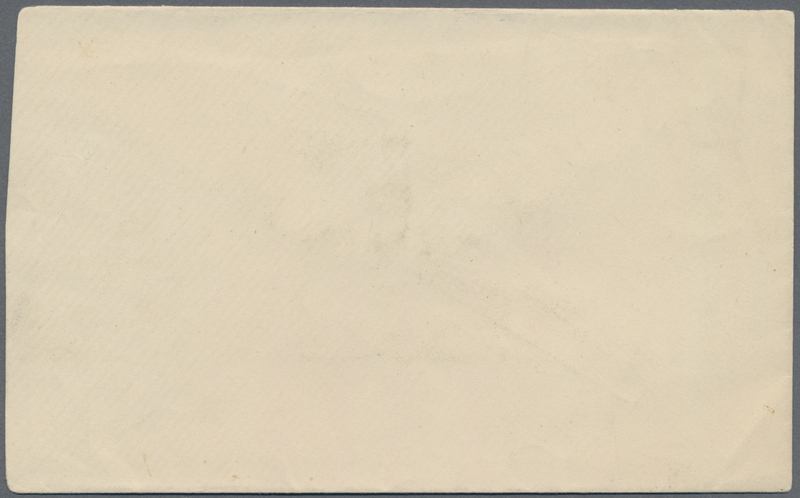 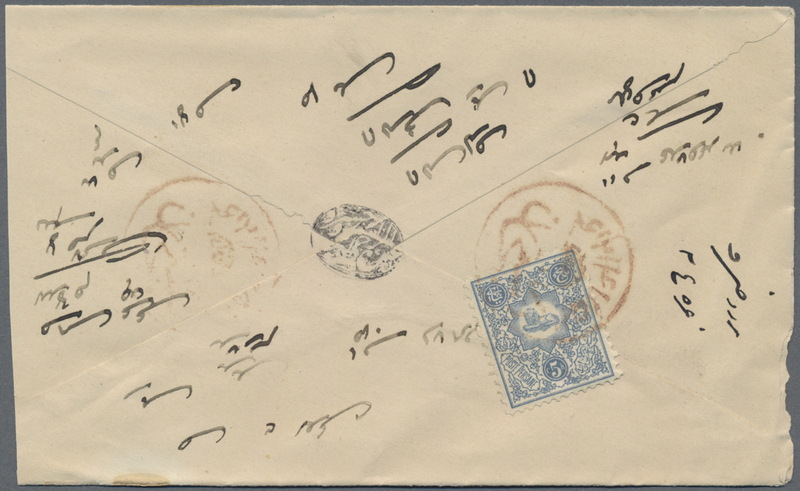 blue, five copies on cover from YEZD, envelope faults/shortened and some postal wear. 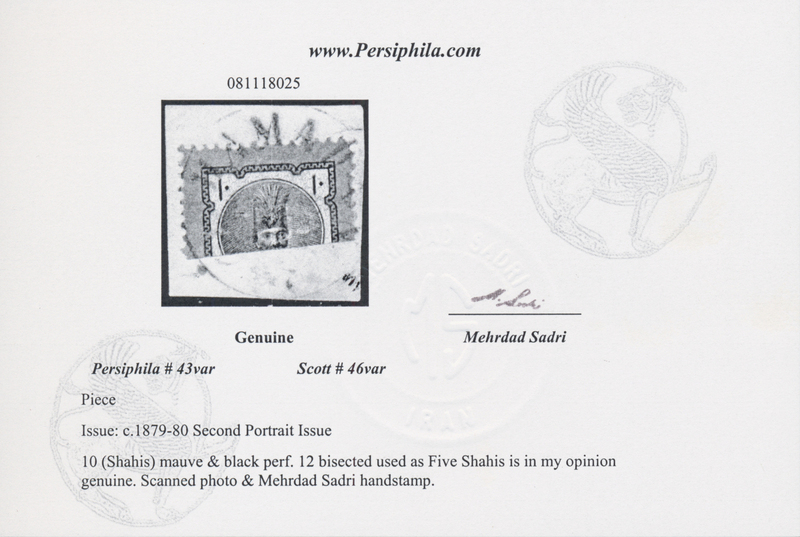 Rare rate. 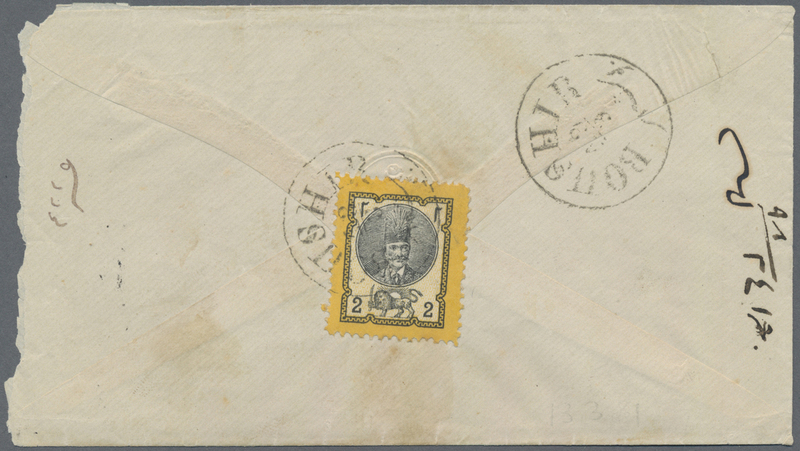 8264 Brief (cover) Sc. 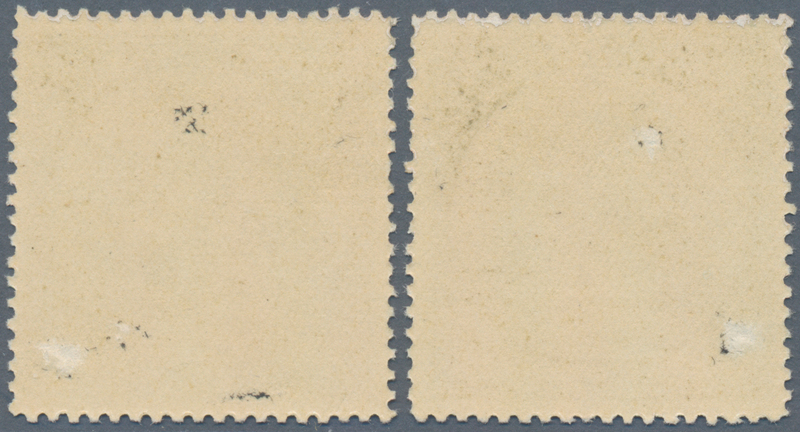 62, 63 (2) 1885, 5ch. 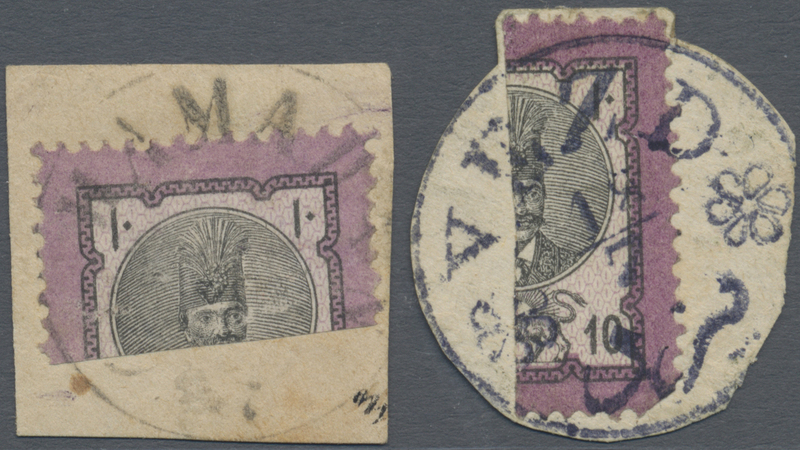 blue and pair 10ch. 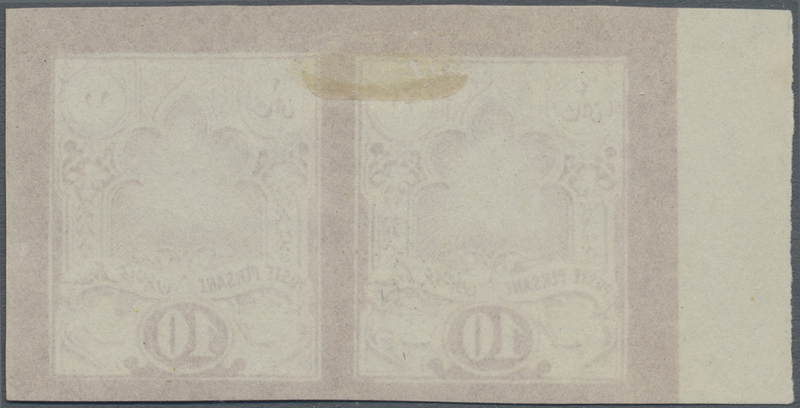 brown, 25ch. 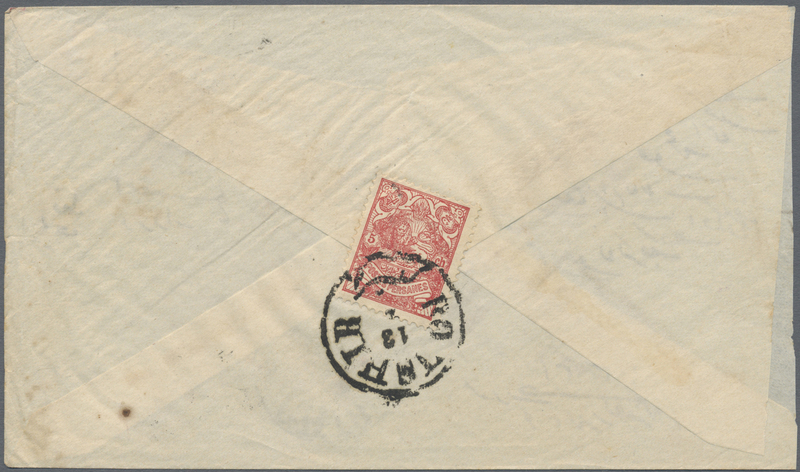 rate on quintruple weight letter from YEZD, some postal wear. 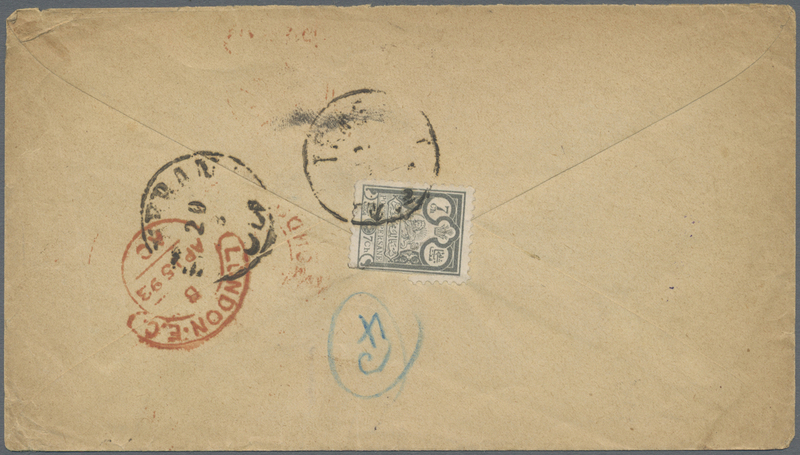 8265 Brief (cover) Sc. 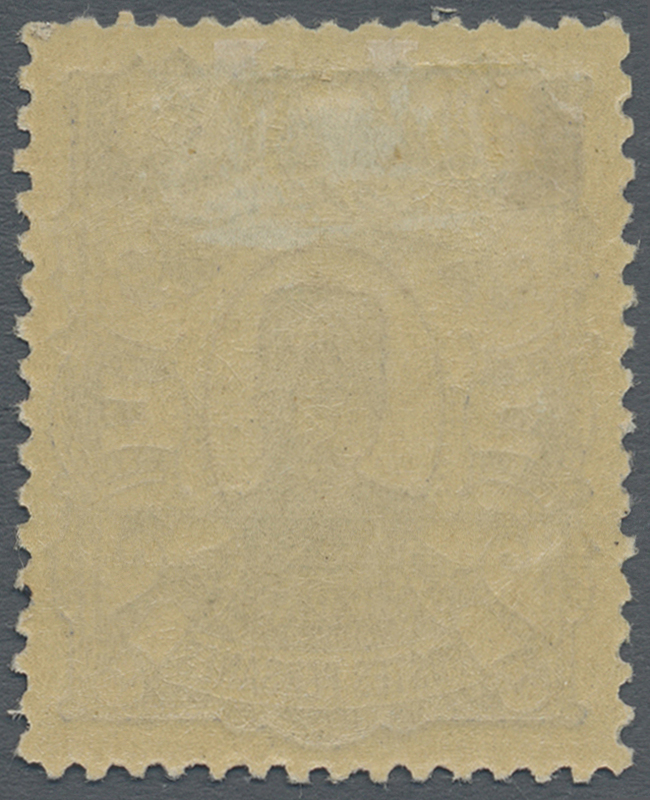 62, 77 1885/1890 (ca. 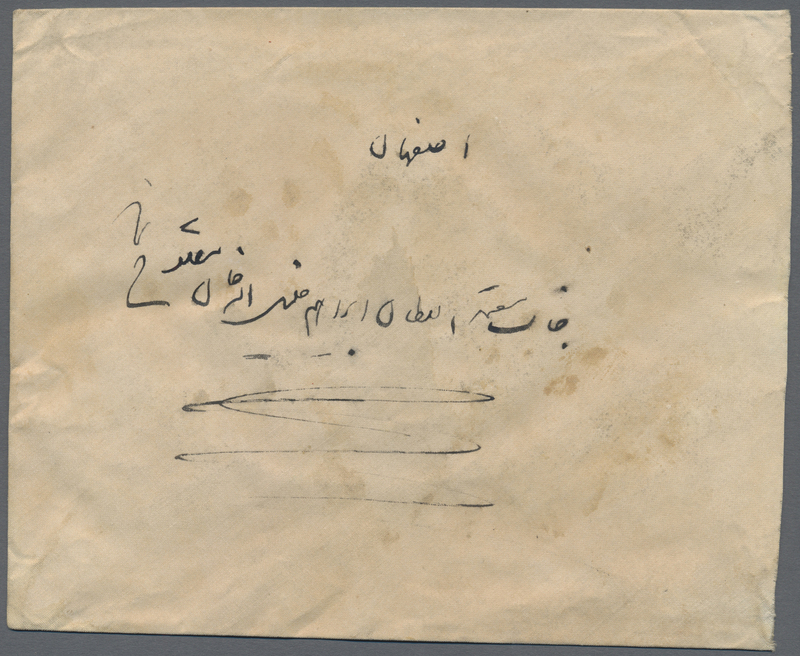 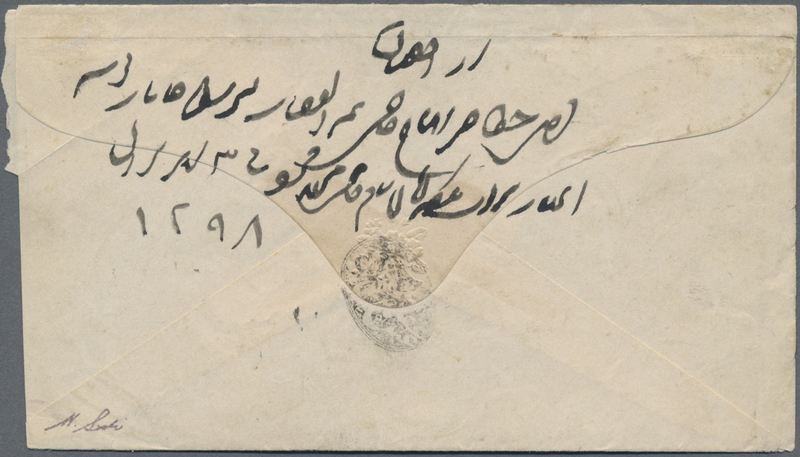 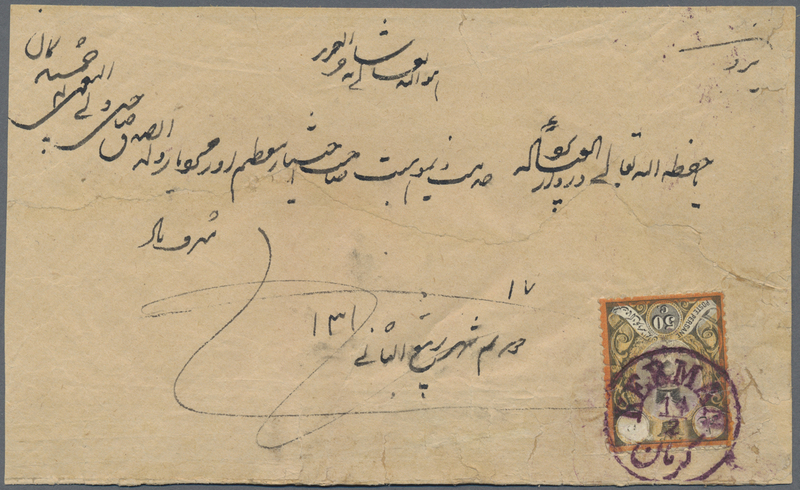 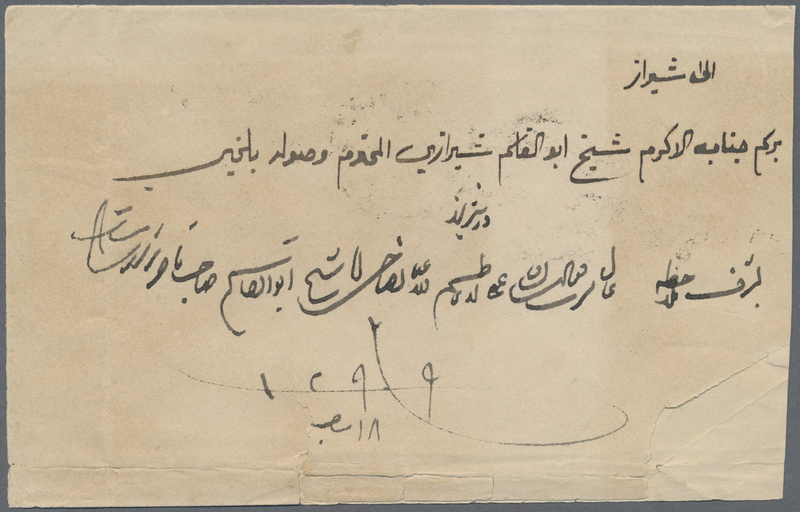 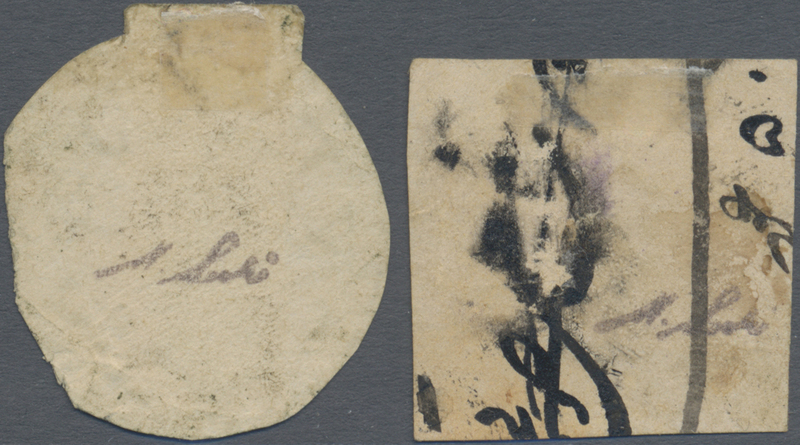 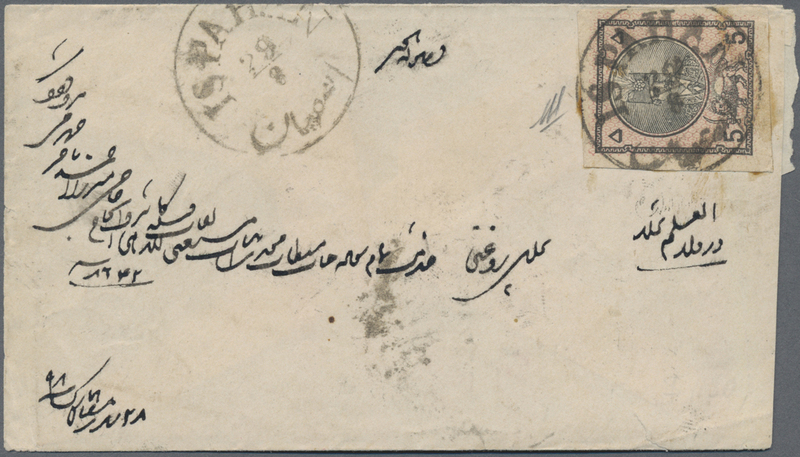 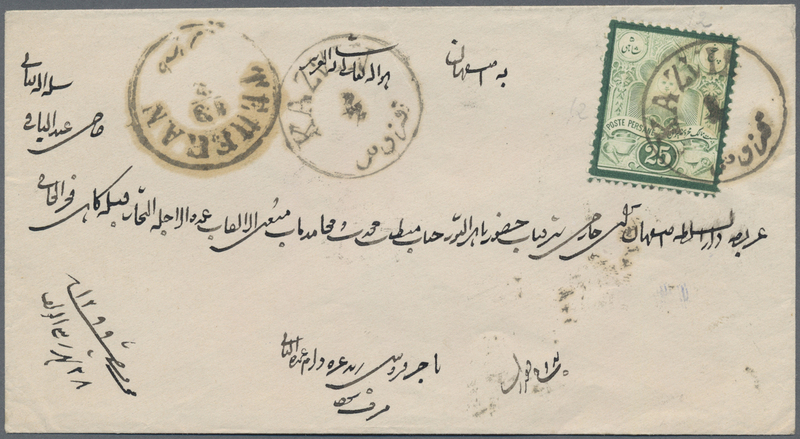 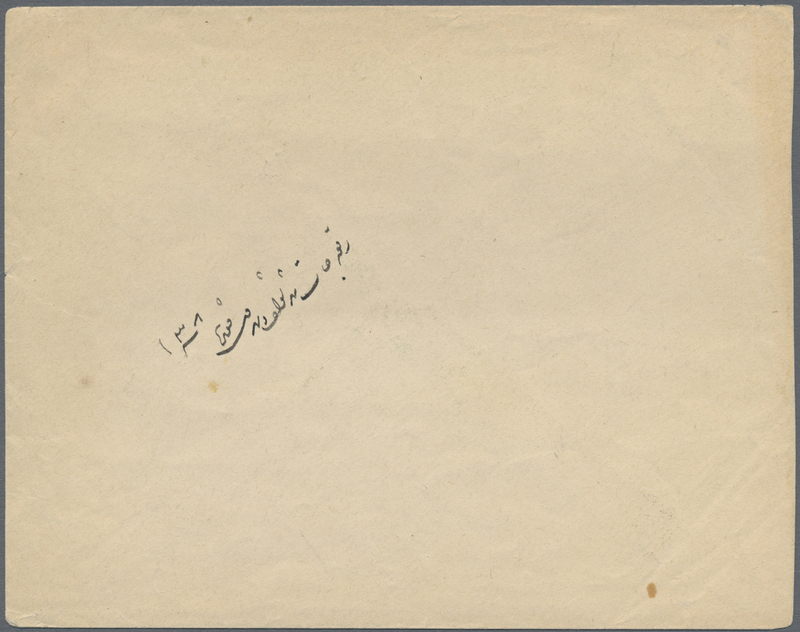 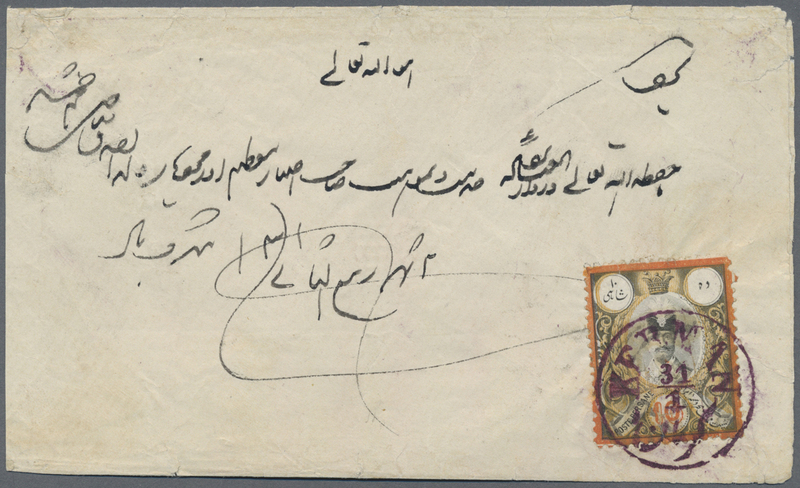 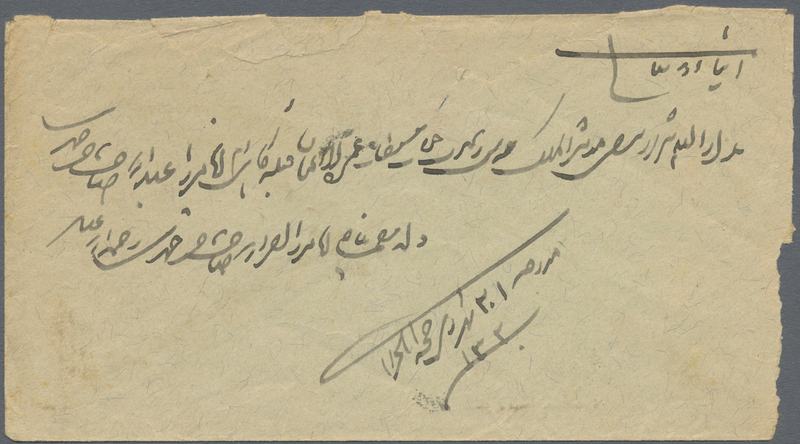 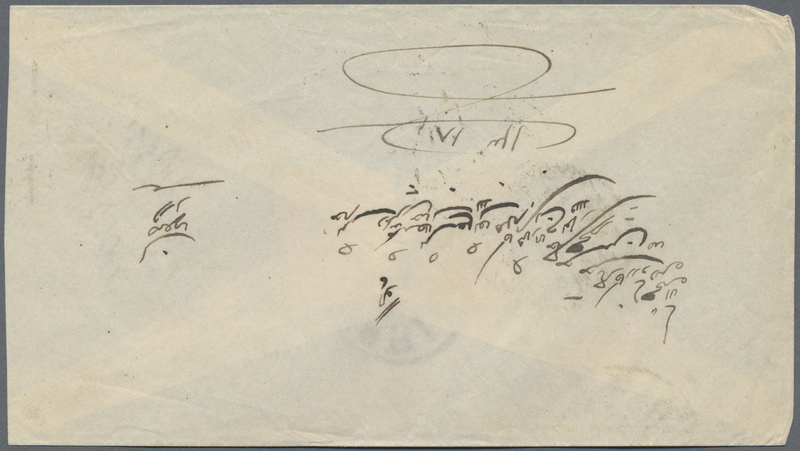 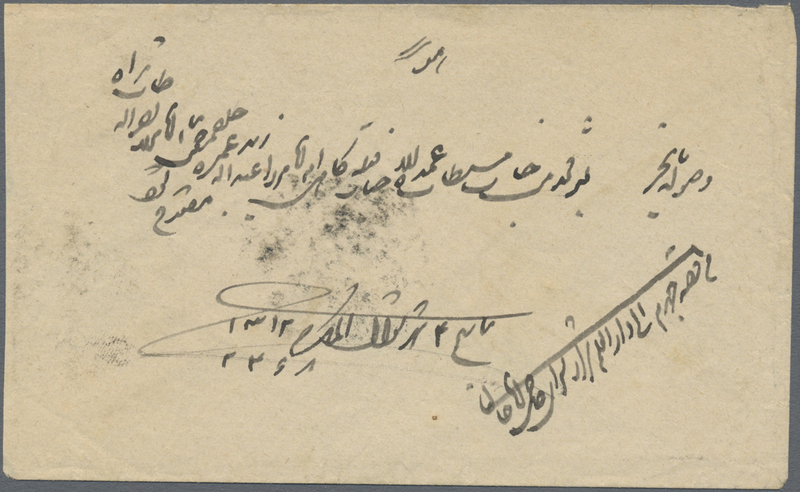 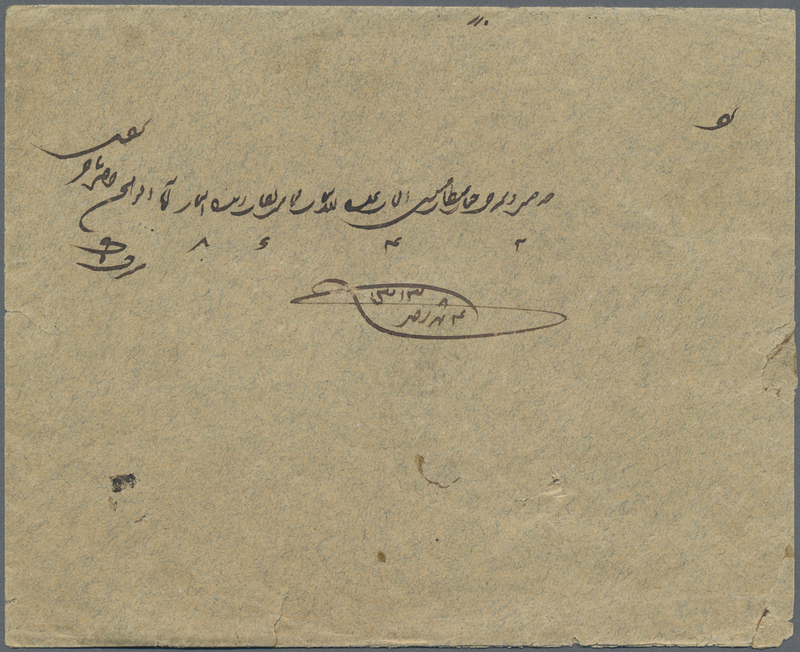 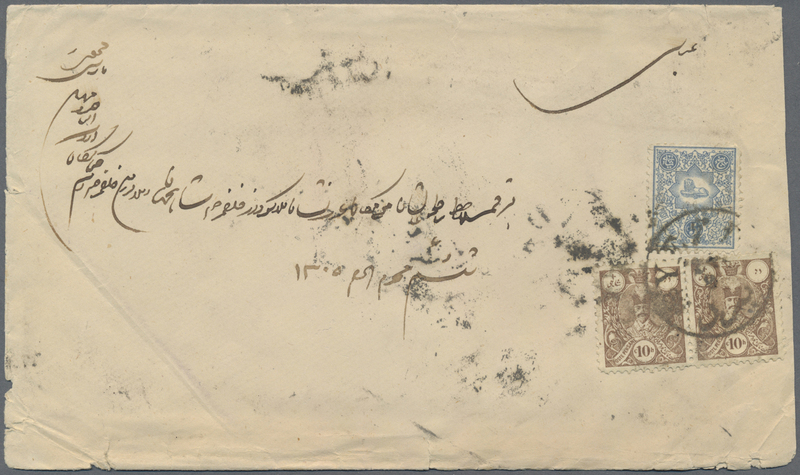 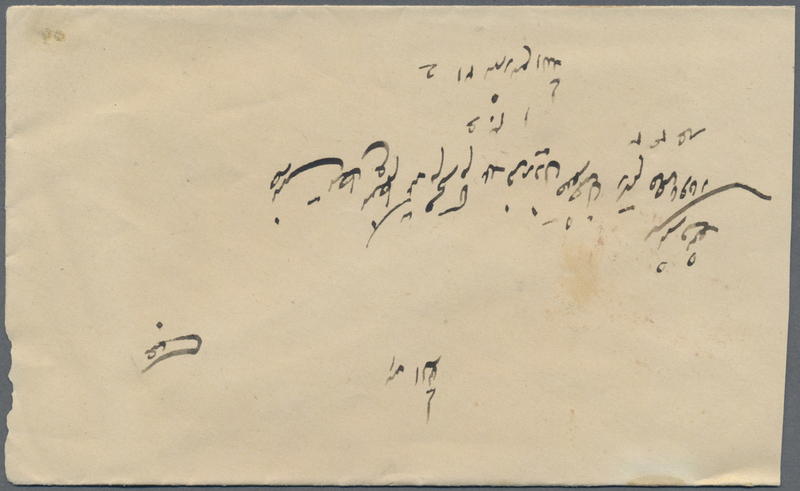 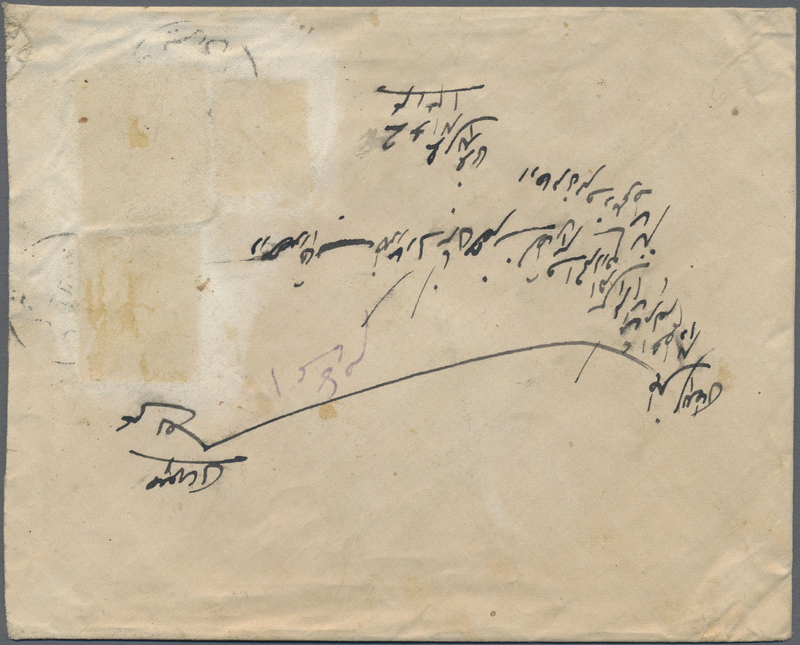 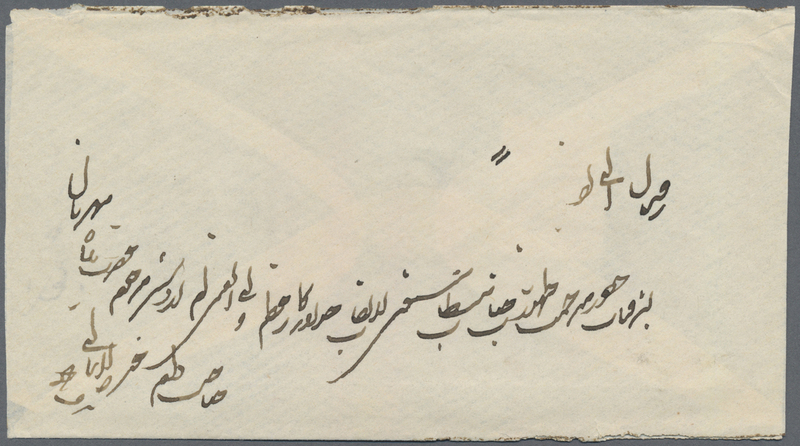 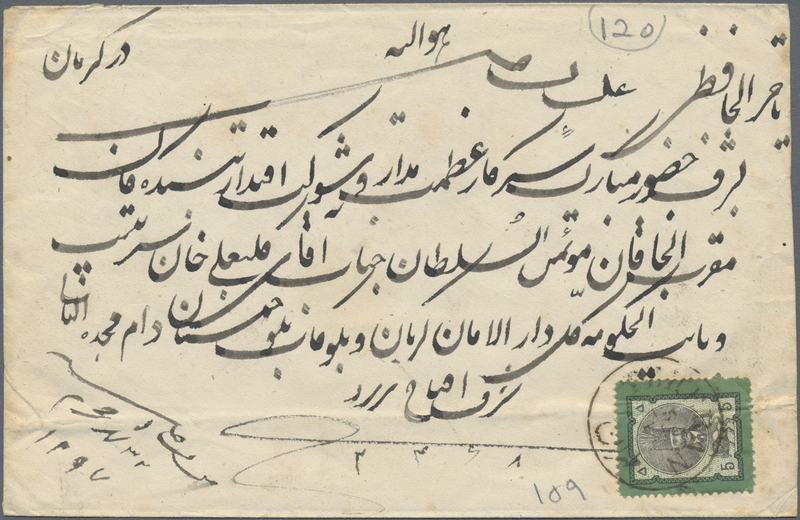 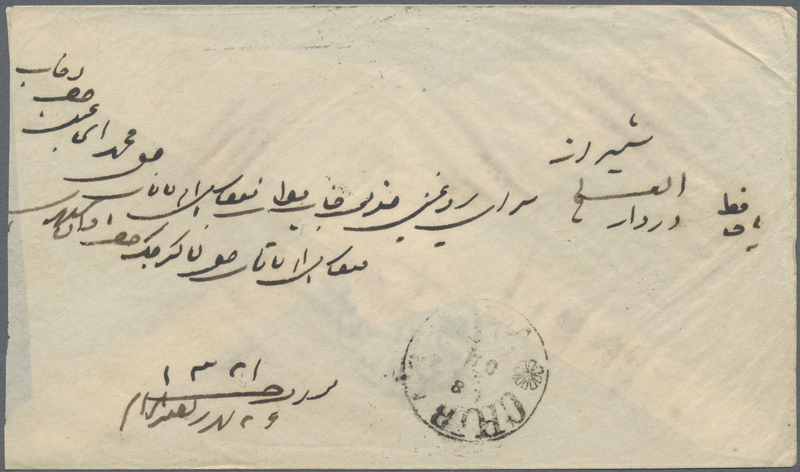 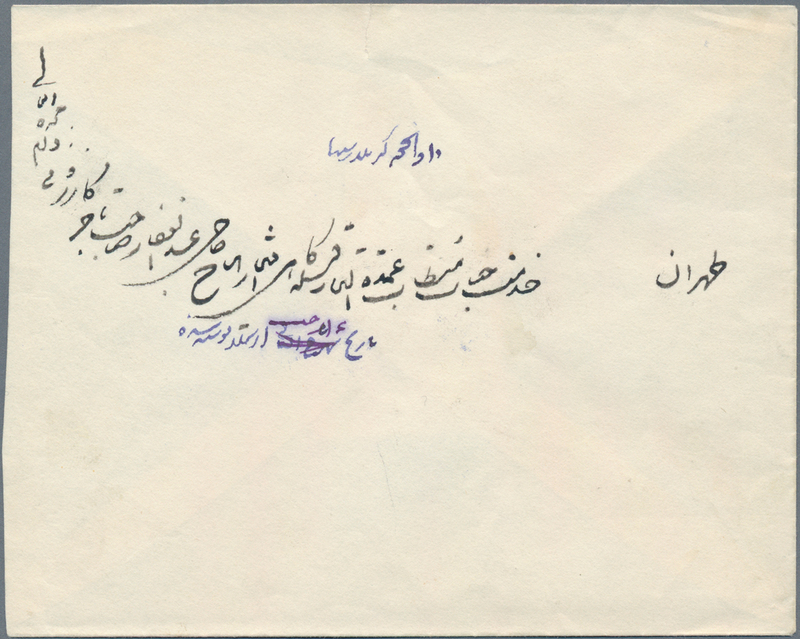 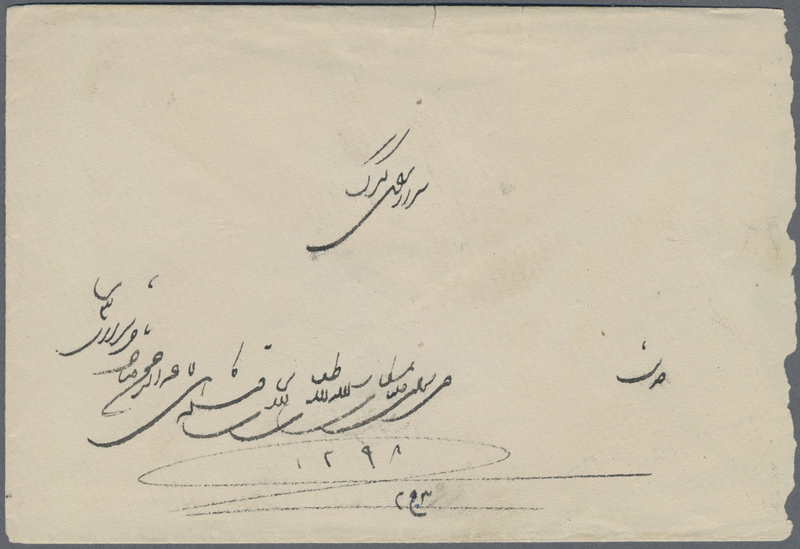 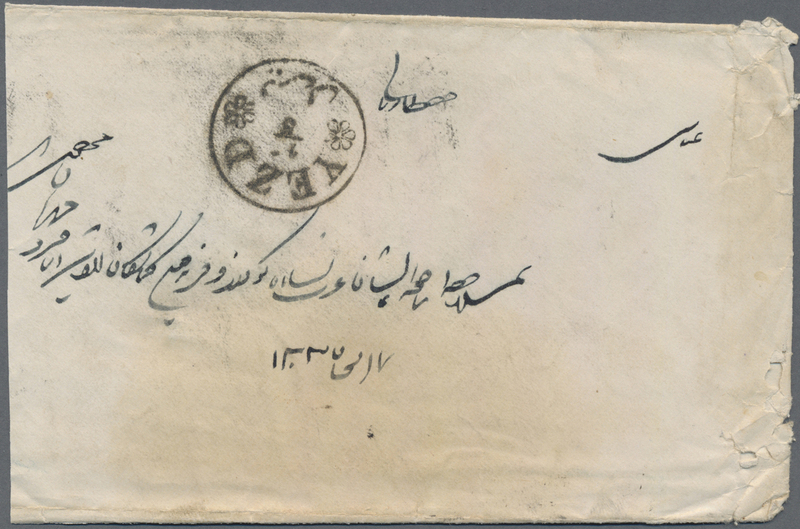 ), two covers from Rafsanjan to Abbassi Yezd. 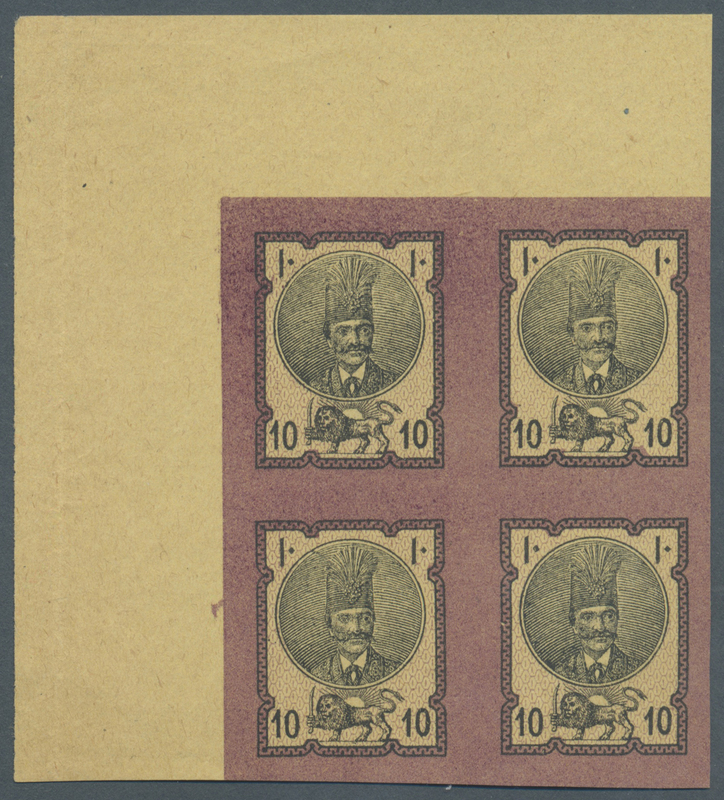 8267 postfrisch (never hinged) ** ungebraucht (hinged) * Sc. 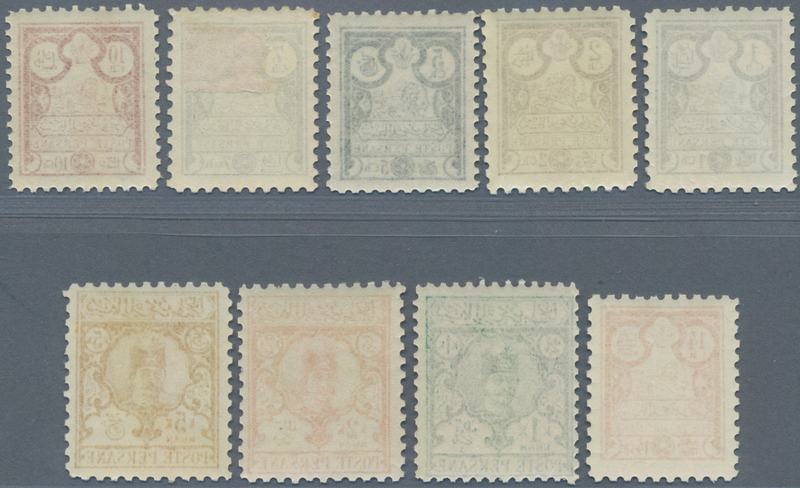 73/80 1889, 1ch.-5kr., complete set of eight values, fresh colours, mint original gum (2ch. 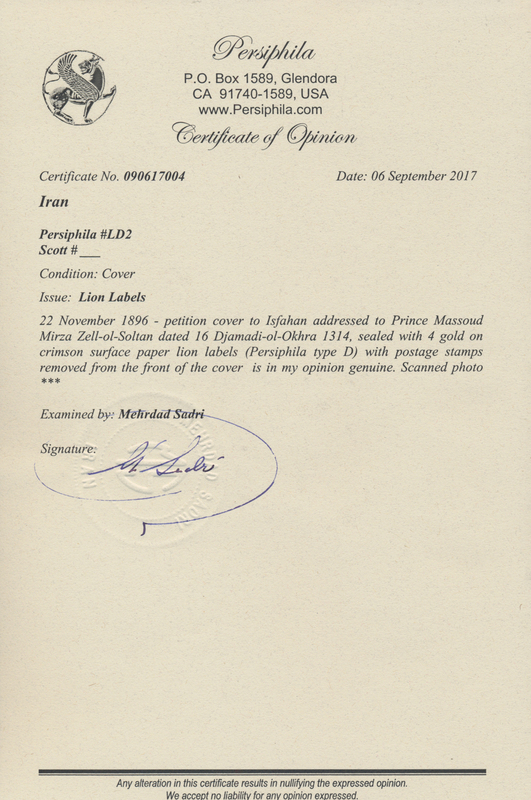 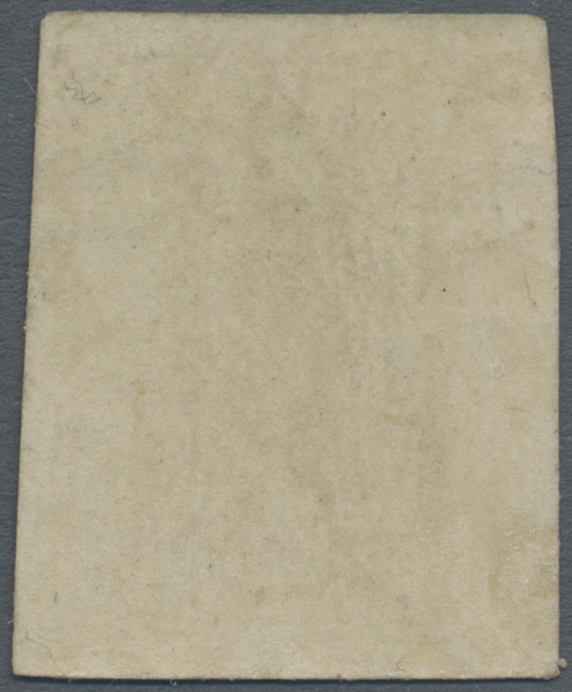 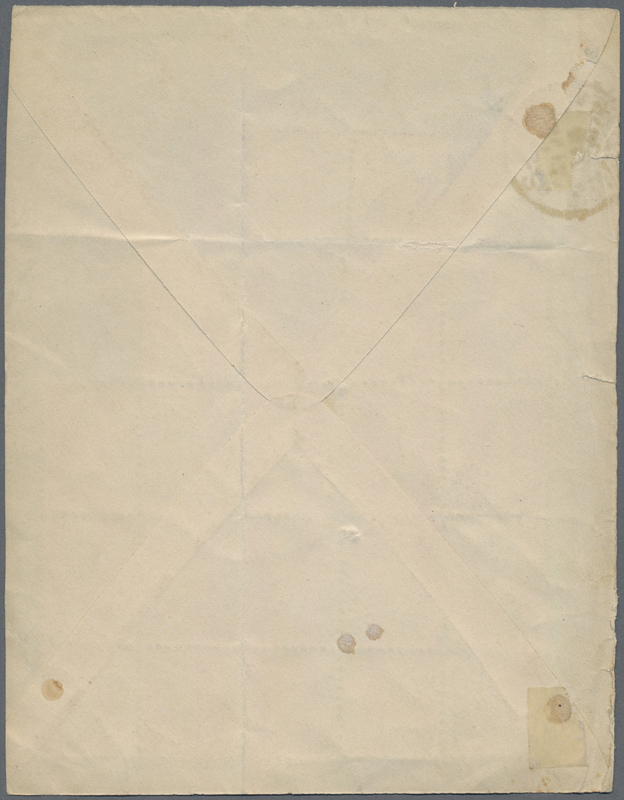 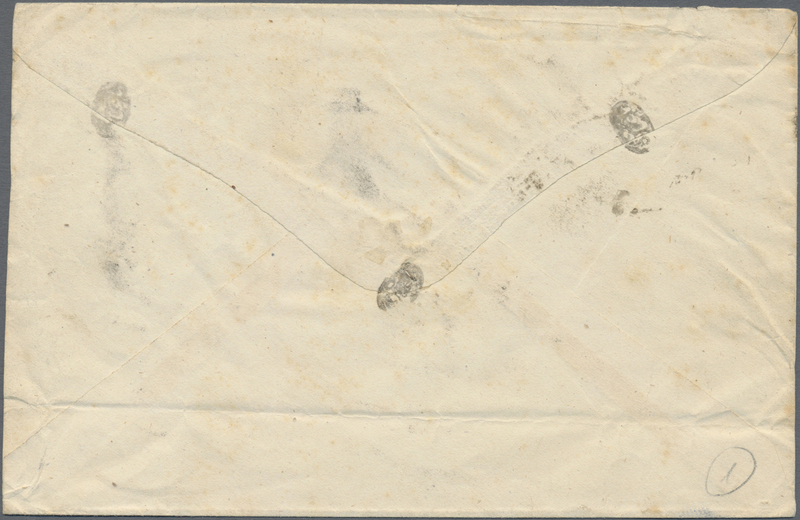 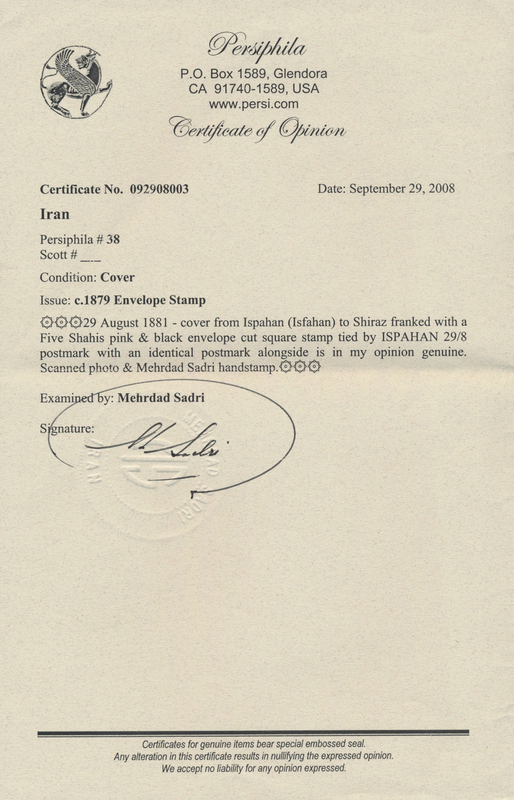 showing traces of postmark). 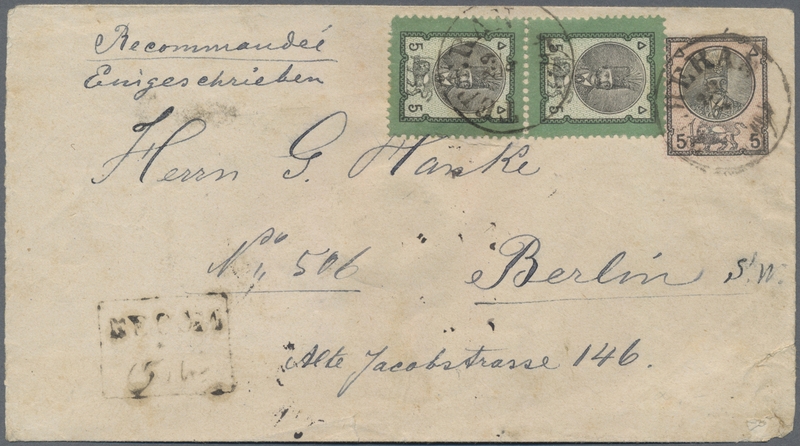 8273 postfrisch (never hinged) ** ungebraucht (hinged) * Sc. 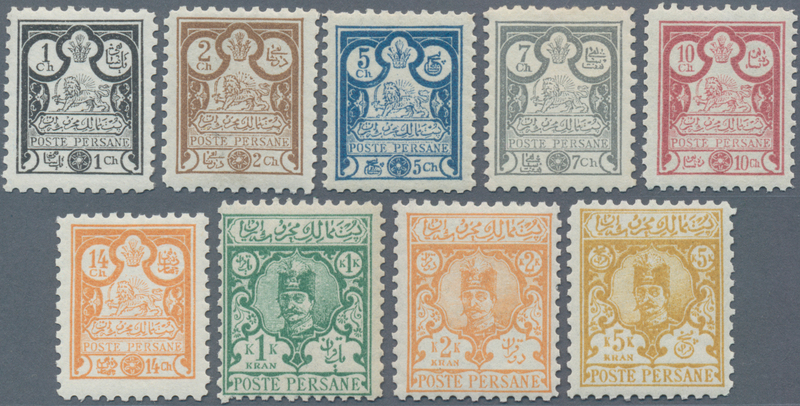 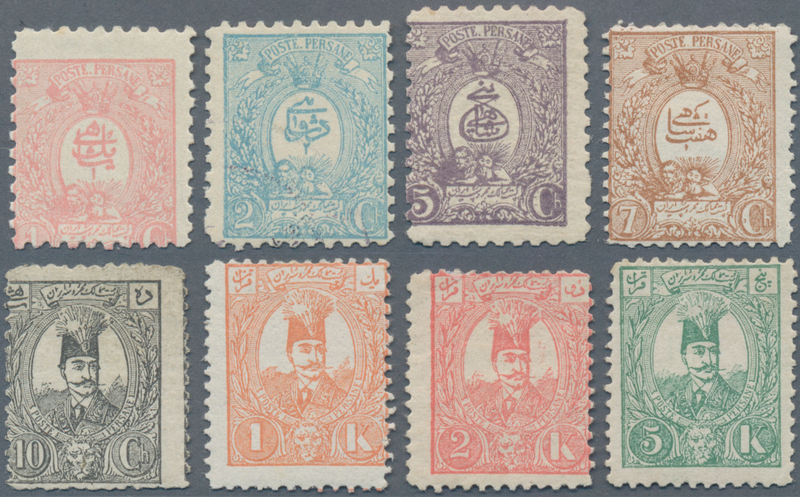 81/89 1891, 1ch.-5kr., complete set of nine values, fresh colours and well perforated, mainly unmounted mint. 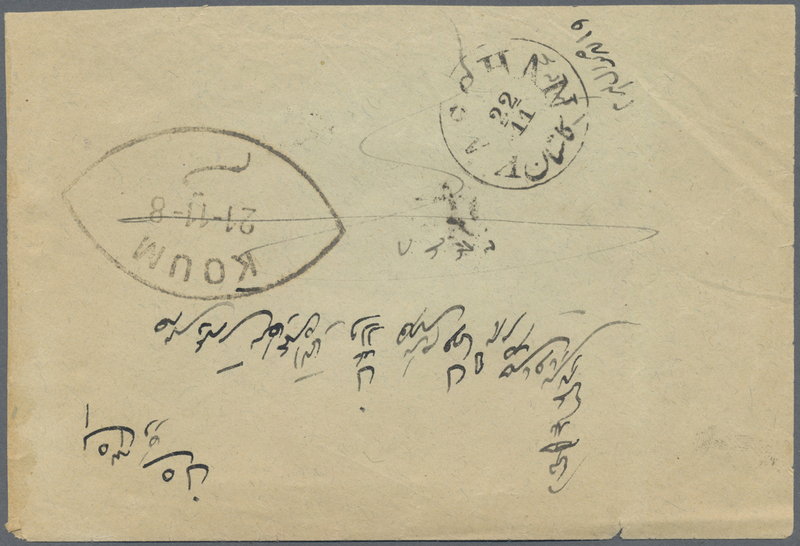 8277 Brief (cover) Sc. 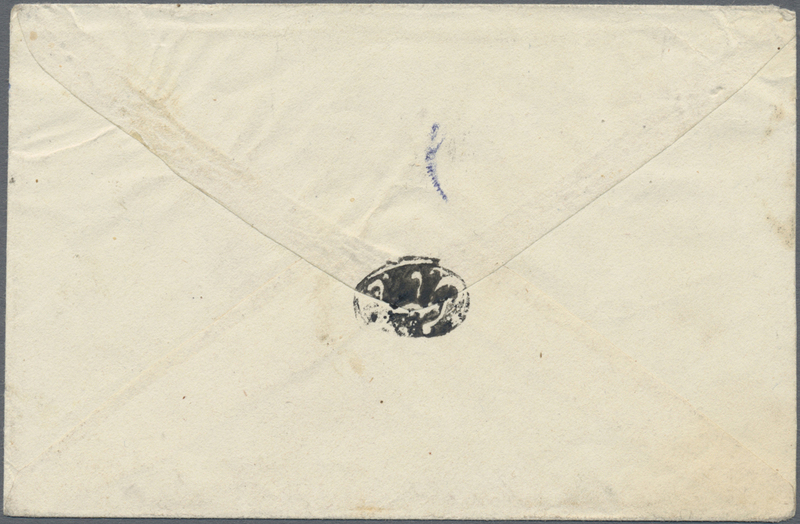 91, 93, 105/06 1894/1898 (ca. 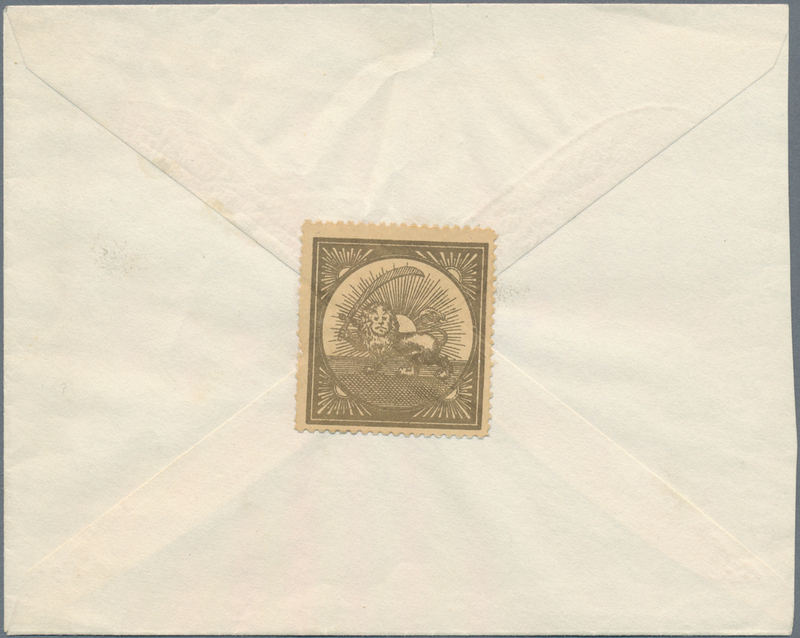 ), two covers: 2c.+8c. 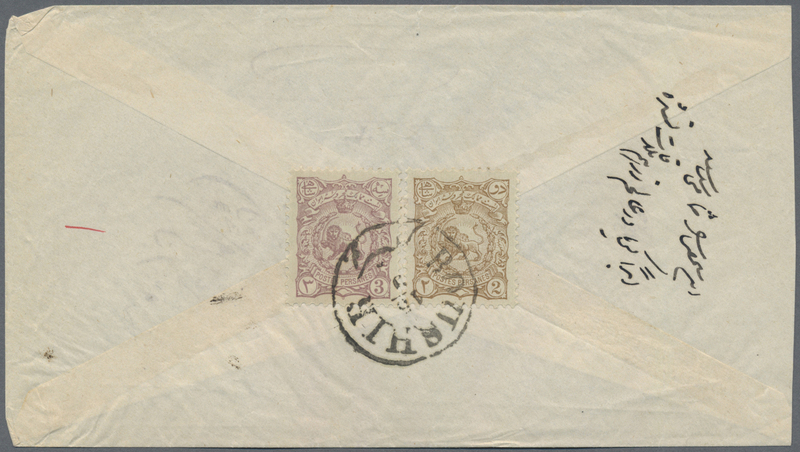 on cover from ABBASSI, 2ch.+3ch. 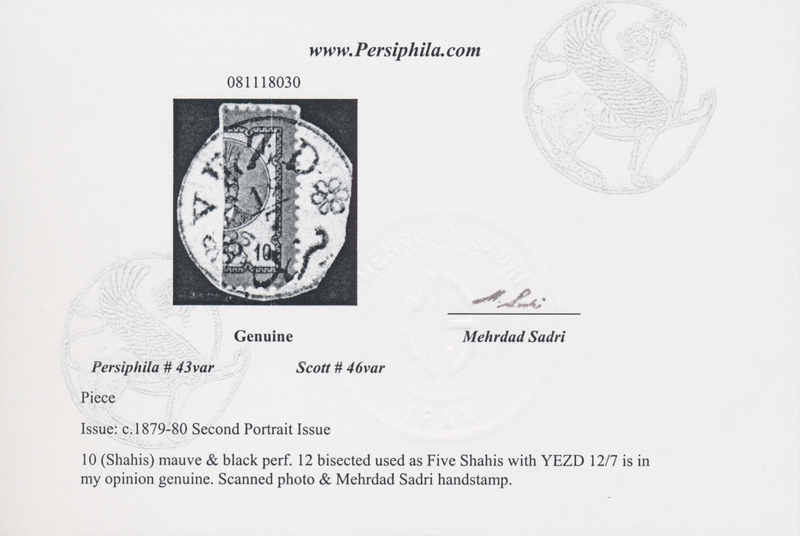 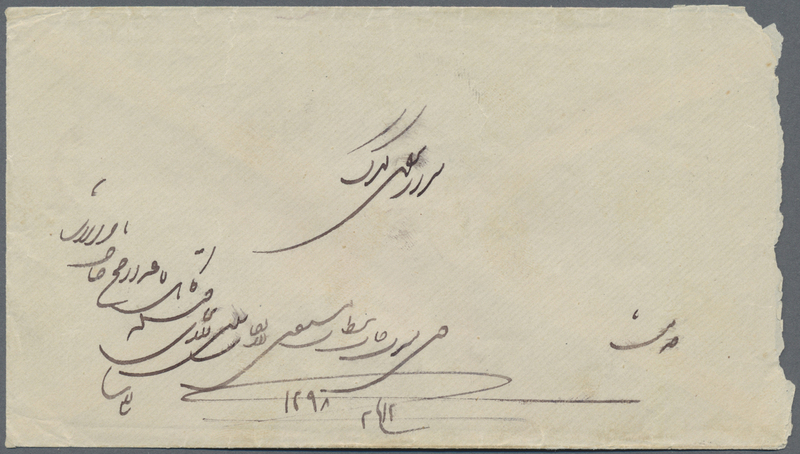 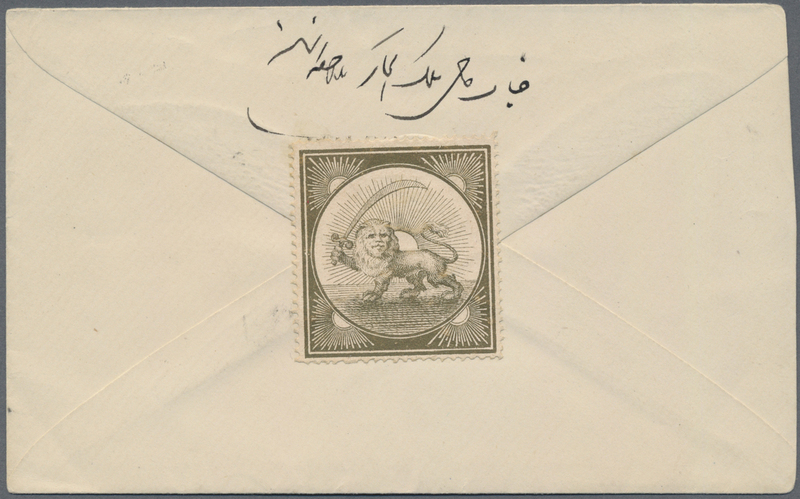 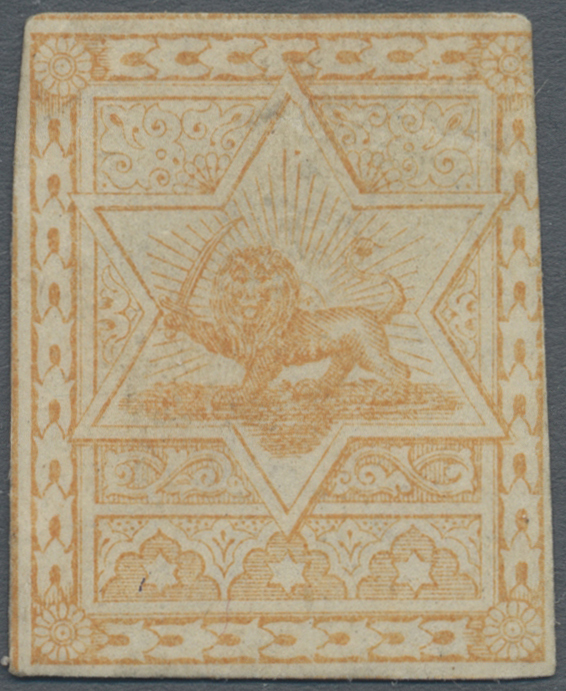 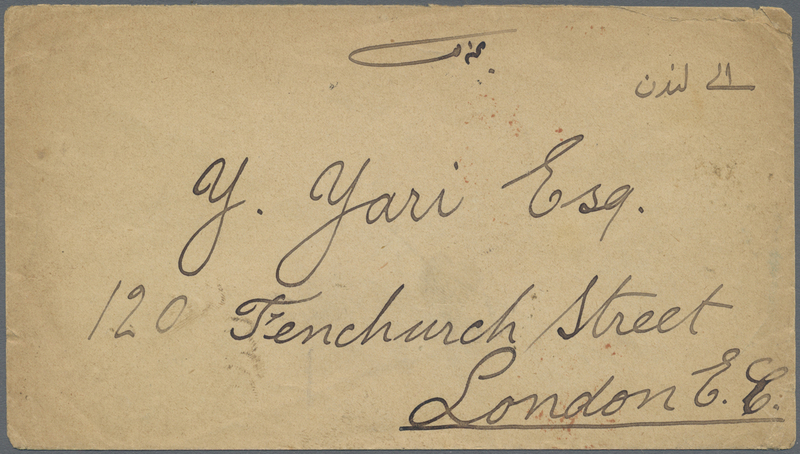 on cover from BOUSHIR, usual postal wear. 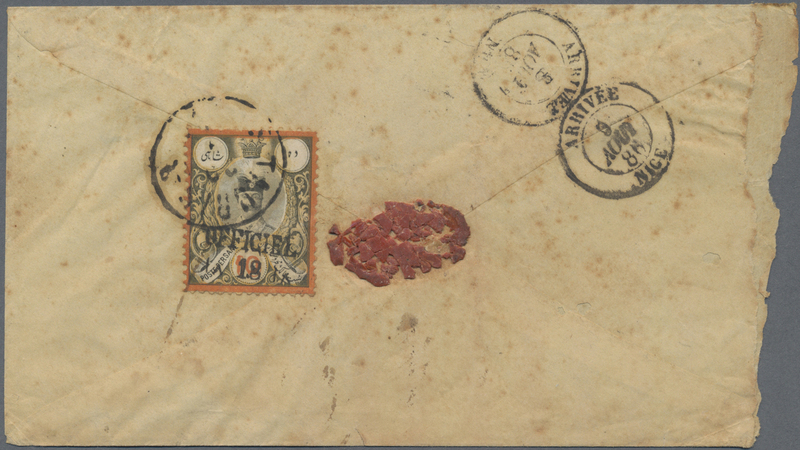 8278 Brief (cover) Sc. 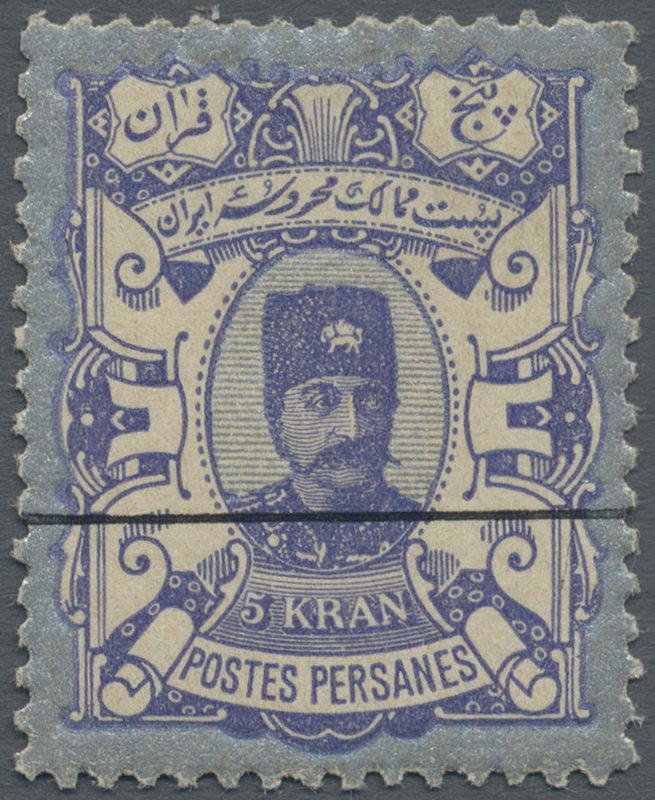 92, 431 1894/1909 (ca. 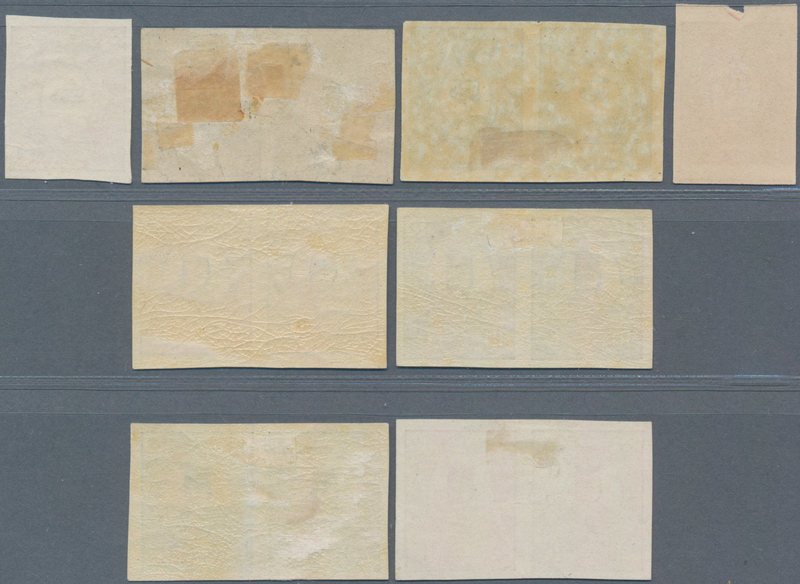 ), two covers: 5ch. 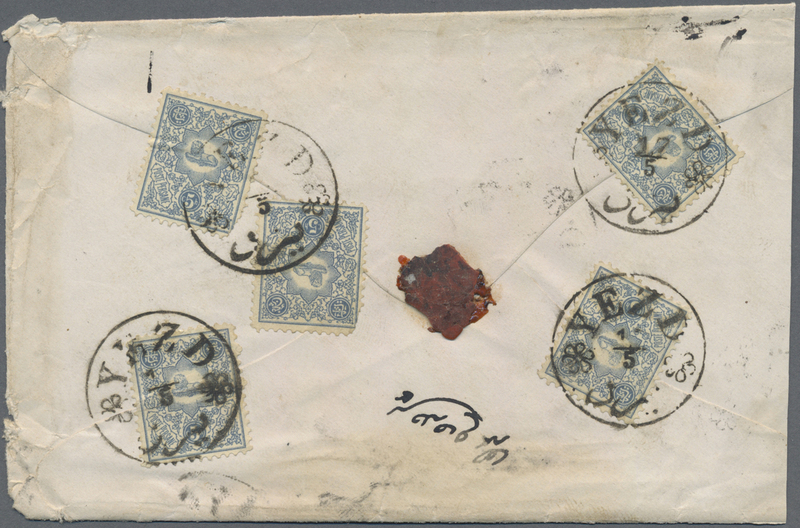 blue on cover from Behbehan to Boushir; 6ch. 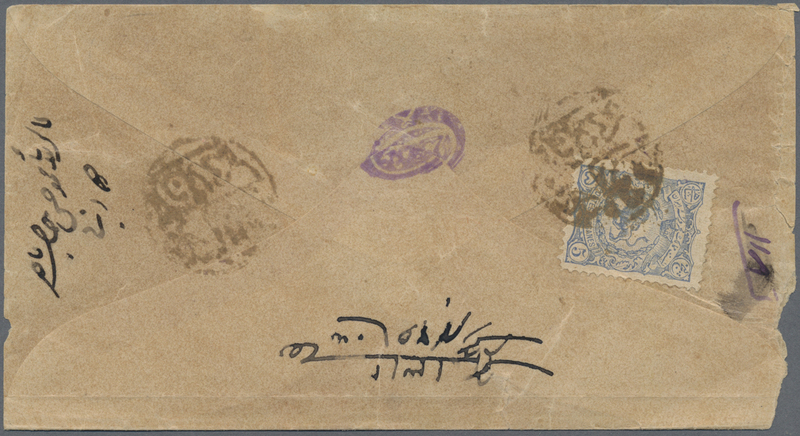 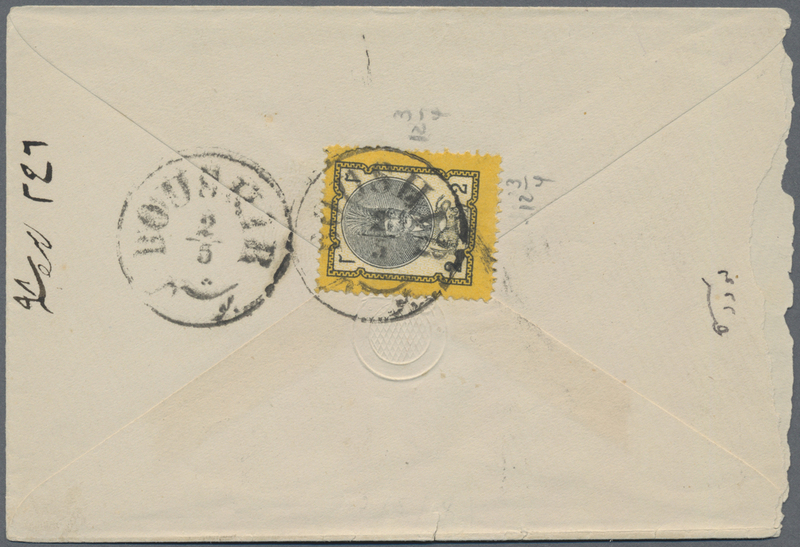 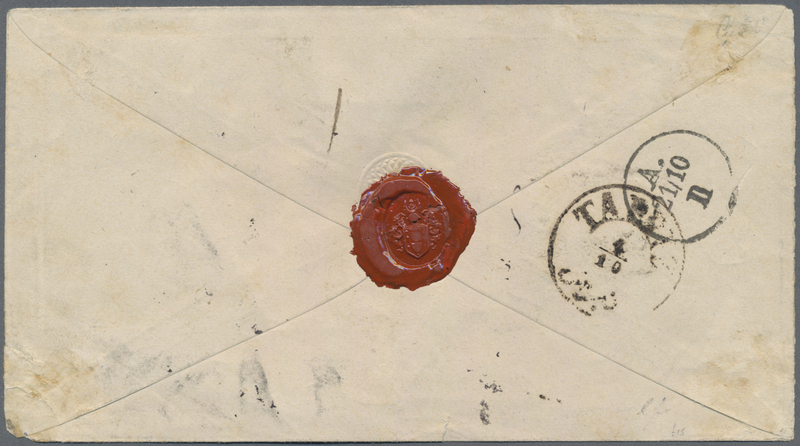 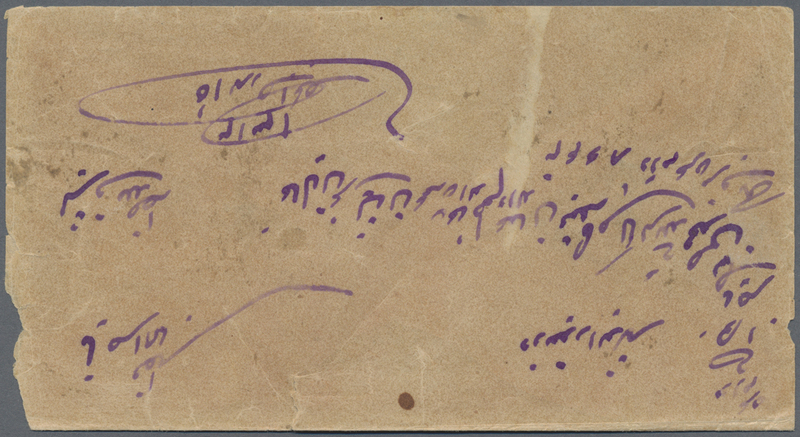 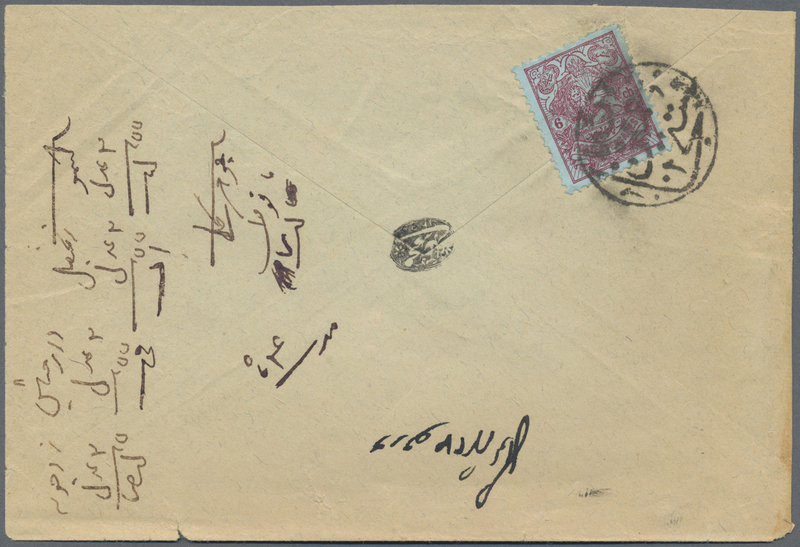 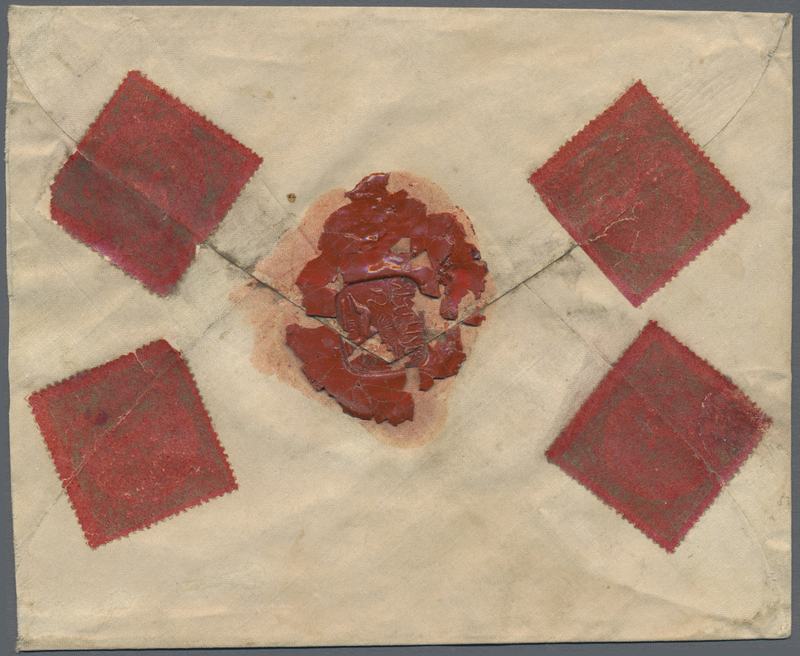 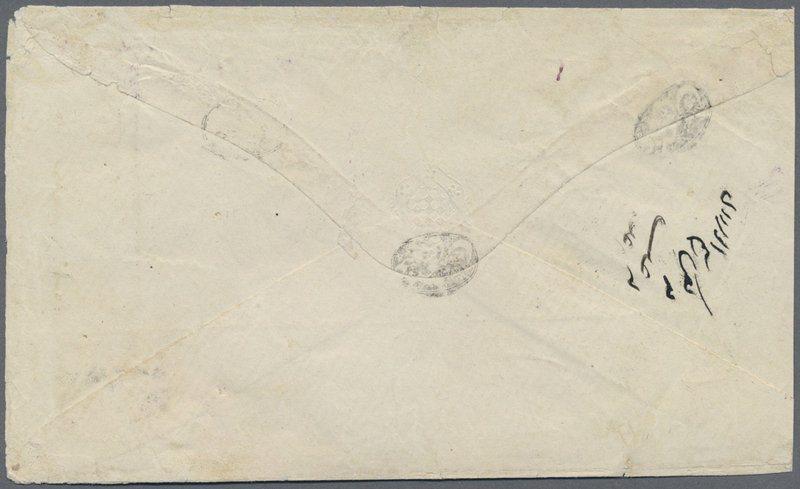 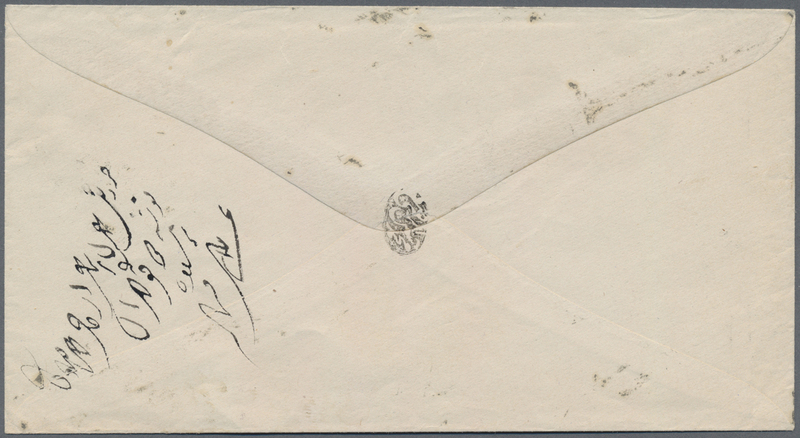 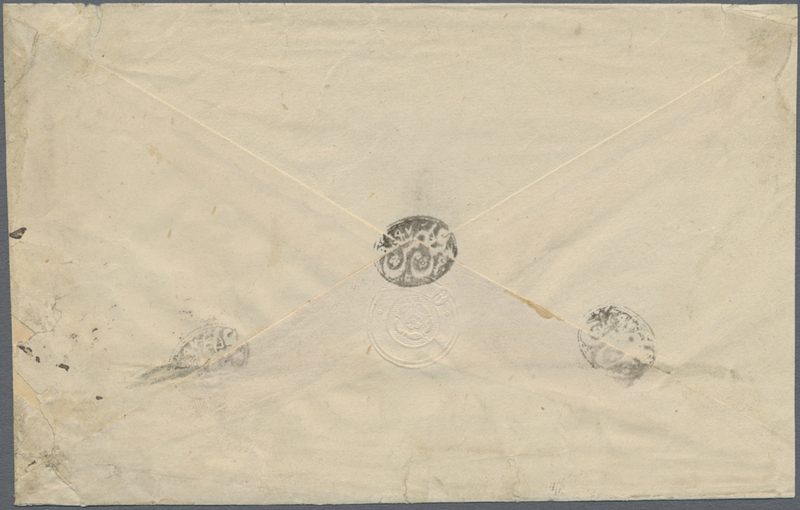 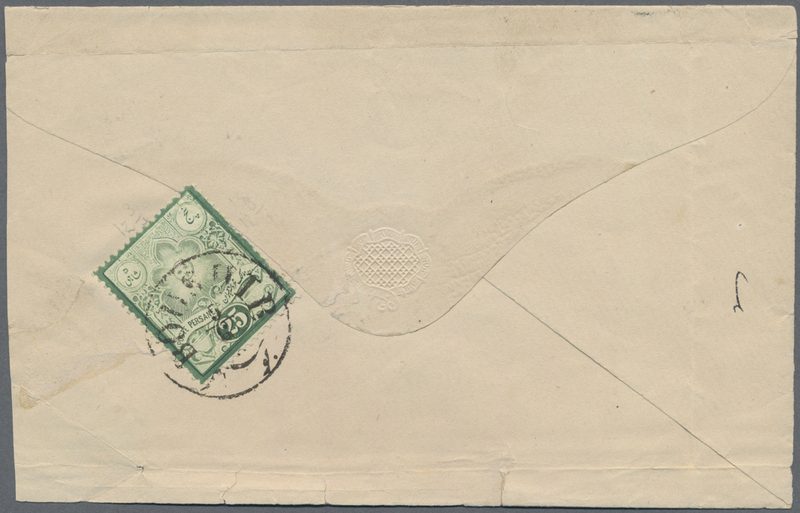 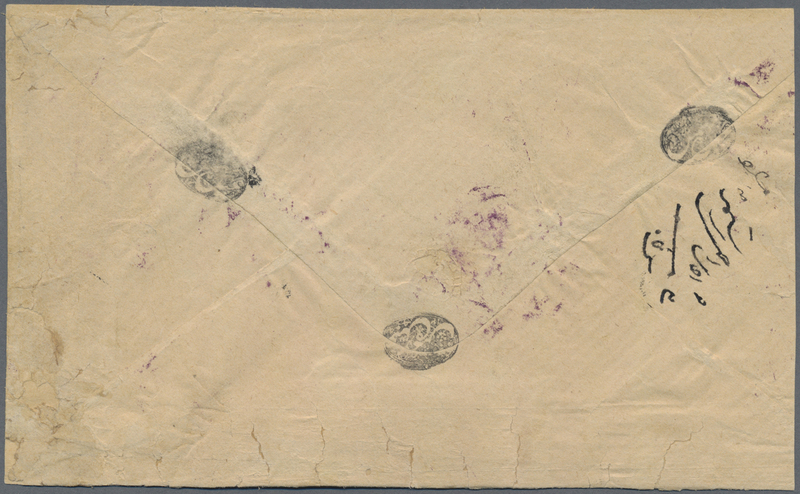 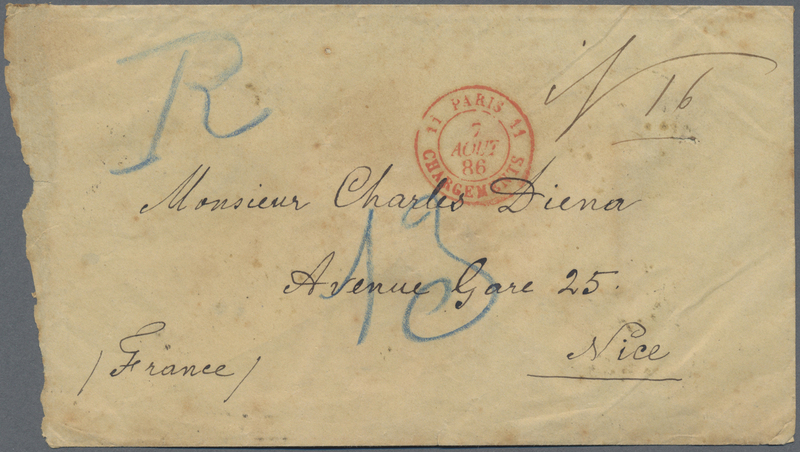 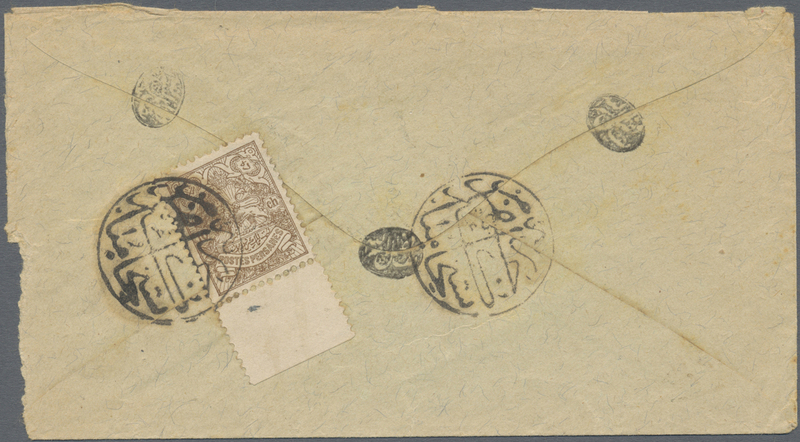 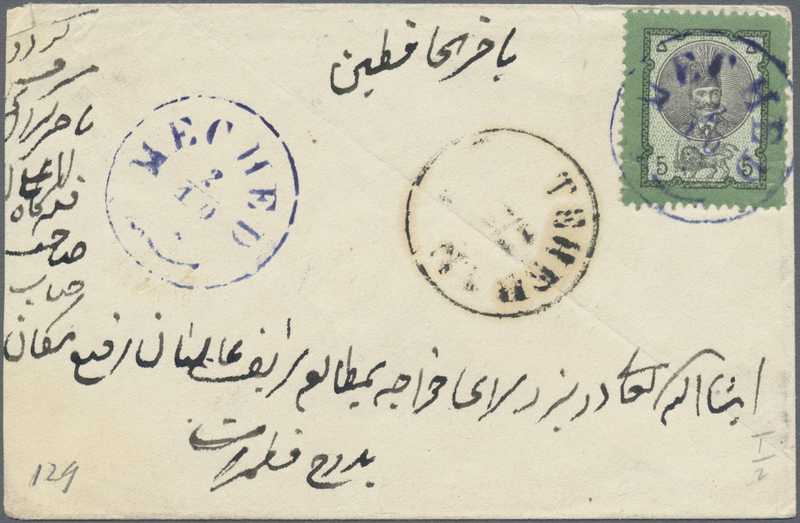 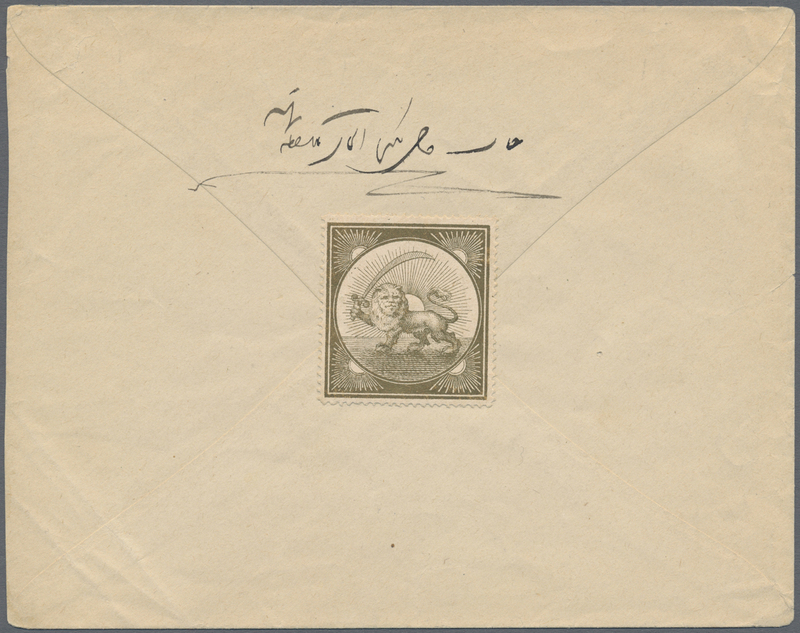 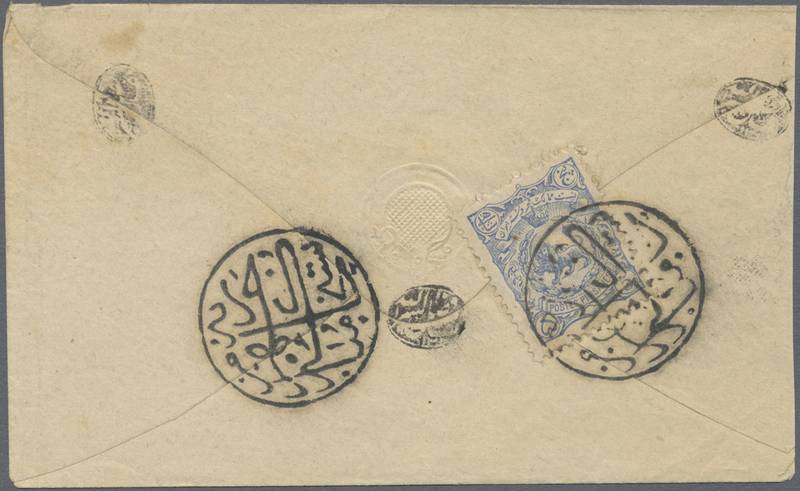 rose on blue on cover from Khomein to Keshen via Koum, some postal wear.